I am pleased to provide you with the NYS Assembly Ways and Means Committee Economic Report. This report is part of our commitment to presenting clear and accurate information to the public. It offers a complete and detailed assessment of the national and State economies. The terrorist attacks of September 11, 2001, and a national recession continue to have a significant impact on the economies of New York State and New York City. Geo-political uncertainty is also a factor in the nation's struggling economy. As indicated in this report, two areas that continue to show weakness are wages and employment. Indeed, Committee staff estimates that in 2002 State wages experienced its worst year-over-year decline since 1938, and the loss of employment in the first quarter of 2002 is the largest it has been in a decade. The Ways and Means Committee staff assessments and projections presented in this report are reviewed by an independent panel of economists, including professionals from major financial and manufacturing corporations and prestigious universities as well as private forecasters from across the State. Assembly Speaker Sheldon Silver and I would like to express our appreciation to the members of this Board of Economic Advisors. Their dedication and expert judgment has once again been invaluable in helping refine and improve the forecasts contained in this report. While they have served to make the work of our staff the best in the State, they are not responsible for the numbers or views expressed in this document. I wish to acknowledge the dedicated and talented staff of the Assembly Ways and Means Committee and their many hours of work that went into producing this document. They play a vital role in our State's budget process. As we continue our efforts toward enacting a budget that is fair for all New Yorkers, I look forward to working with each of you. A modest national economic recovery from the current recession is expected to continue in 2003. However, economic uncertainty and ongoing fears regarding terrorism and the possibility of war continue to be of great concern. New York State was hit harder by the recession than the nation as a whole, and its recovery also lags that of most other states. For New York State, poor stock market performance and the terrorist attacks of September 11th compound the effects of the recession. It is important to note that most of the State's economic weakness is found in New York City. Two important indicators that continue to show weakness are wages and employment. 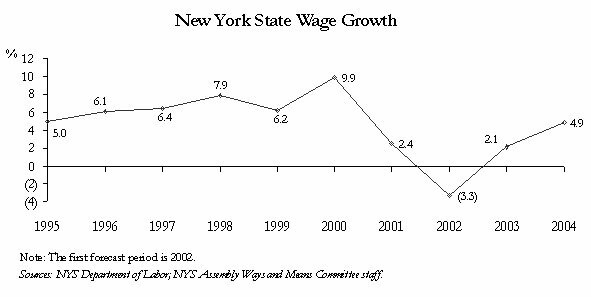 The NYS Assembly Ways and Means Committee staff estimates that in 2002, State wages experienced their worst year-over-year decline since 1938. The Ways and Means Committee staff forecasts that State wages will grow 2.1 percent year-over-year in 2003 and 4.9 percent in 2004. Although this is a significant improvement from 2002, it is still sluggish compared to historic growth rates. New York's employment numbers also reflect the State's economic difficulties. In the first quarter of 2002, New York State lost 224,900 jobs or 2.7 percent compared to the same period a year ago. The loss of employment in the first quarter of 2002 is the largest since the first quarter of 1992. The Committee staff estimates that the State economy will continue to lose jobs until the first quarter of 2003, resulting in a year-over-year decline for 2002 of 155,400 or 1.8 percent. The forecast expects that employment will rebound by 0.4 percent year-over-year during 2003 and by 1.6 percent year-over-year during 2004. Looking forward, New York will join with the rest of the nation in benefiting from general improvement across all economic sectors. In general, however, the recovery in New York State is expected to be weaker and slower than in the rest of the nation. New York State was hit harder than the nation by the recent recession. This is especially true of wages, which grew in 2002 for the nation but are estimated to have declined for the State. For the State, employment dropped more during the 1990-91 recession than during the most recent recession. However, wages were hit harder by this recession than by the 1990-91 recession. The NYS Assembly Ways and Means Committee staff estimates that the State economy continued to lose jobs throughout 2002, resulting in a year-over-year decline of 155,400 or 1.8 percent. State payroll employment is forecast to grow 0.4 percent or 34,200 jobs during 2003 and 136,400 or 1.6 percent during 2004. The State employment forecast of a 0.4 percent increase in 2003 is 0.2 percentage points lower than the forecast from Global Insight and 0.1 percentage points higher than the forecast from Economy.com. The New York State economy lost 224,900 jobs (or 2.7 percent) in Q1 2002, compared to the same period a year ago. The last time before 2001 that State employment declined was Q2 1993, when it fell 18,200 or 0.2 percent. Every industry in 2002 (at the one-digit Standard Industry Classification level) in the private sector lost jobs at annual rates ranging from 1.0 percent in the services sector to 8.1 percent in the manufacturing sector. The last time all sectors declined was in Q1 1992. Wages in 2002 are estimated to have declined year-over-year by 3.3 percent, the worst decline since 1938. State wages are forecast to grow 2.1 percent year-over-year during 2003 and 4.9 percent during 2004. The State wage forecast of 2.1 percent increase in 2003 is significantly lower than Global Insight's forecast of 4.8 percent and Economy.com's increase of 5.4 percent. 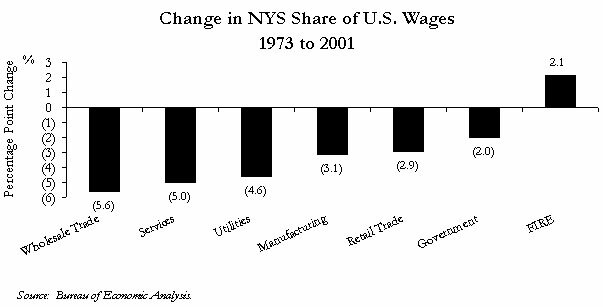 Much of the employment growth in New York State between 1980 and 2000 was in lower wage industries. Nevertheless, average wages over this period grew at 5.5 percent per year due to rising average wages in manufacturing and growth in high-wage industries such as securities and legal services. 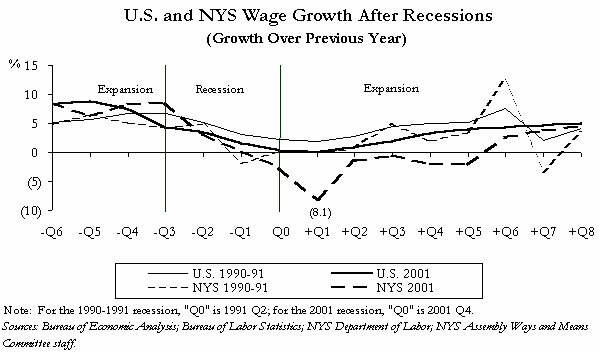 New York State wage growth dramatically decelerated from 16.2 percent in Q1 2000 to 8.7 percent in Q1 2001 to negative 8.1 percent in Q1 2002; wage growth was 24.3 percentage points less in Q1 2002 than in Q1 2000. New York State suffered a triple impact from poor financial market performance. Variable compensation on Wall Street suffered, stock options exercised dropped across the board since many held no exercise value, and capital gains also dropped substantially. Variable compensation is the most volatile component of wages and plays a particularly important role in the movement of financial sector wages over time. State total variable compensation, which was $44.9 billion or 11.4 percent of total State wages in 2001, are estimated to have declined $11.3 billion or 25.2 percent year-over-year during 2002 to $33.6 billion. A further decline of $2.8 billion or 8.3 percent is forecasted for 2003 but variable compensation is expected to rebound $2.7 billion or 8.6 percent in 2004. The 2003 variable compensation level is expected to be the lowest since 1997. Securities industry profits in 2002 are estimated to have been the lowest in eight years at $4.8 billion, after including settlement charges and anticipated litigation costs. This is a 54 percent or $5.6 billion drop and follows a $10.6 billion decline in securities industry profits in 2001, the largest dollar drop in history. Total corporate underwriting volume was up in 2002 due to rising debt underwriting. However, total equity underwriting volume was down. IPO underwriting was particularly low, down 28.4 percent from 2001 and reaching its lowest level in ten years. Mergers and Acquisitions dollar volume was down 45 percent in 2002 from 2001 and 74 percent from its 2000 record of $1.7 trillion. The 2002 level was the lowest since 1994. The national economy, as measured by U.S. Real Gross Domestic Product (GDP), will grow 2.5 percent during 2003 and 3.5 percent during 2004, after estimated growth of 2.4 percent in 2002. Consumption spending will decelerate year-over-year to 2.3 percent during 2003, down from the 3.1 percent estimated for 2002. A growth rate of 3.4 percent is expected for 2004. Investment spending will grow 5.2 percent year-over-year in 2003 and 8.0 percent in 2004, a significant improvement when compared to 2001 and 2002. Investment spending in 2001 posted the only double-digit decline since 1982, and the fourth such decline since 1950. National employment will grow 0.5 percent in 2003 and 1.6 percent in 2004, following a decline of 0.9 percent in 2002. Unemployment, which generally lags changes in economic growth, is expected to peak at 6.1 percent in Q2 2003 and then to gradually decline. Housing construction, price growth, and refinancing activity played a role to cushion the effects of recession and was key to the economy's recovery in 2002. The most prominent factor supporting the strength in the housing market is mortgage rates. 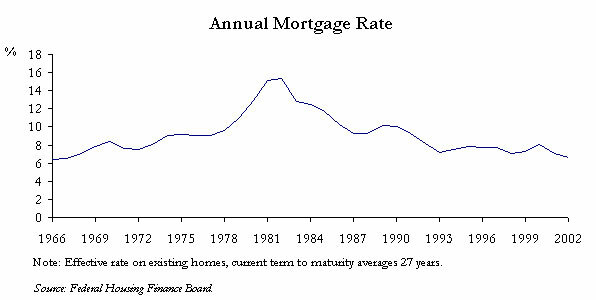 Long-term mortgage interest rates in 2002 were the lowest in thirty-four years. From peak to trough, the stock market declined 37.8 percent, the largest decline since the 1973-74 drop. Although the S&P 500 index is likely to record another year-over-year decline in 2003, it is forecast to rise quarter-to-quarter throughout 2003 as corporate earnings improve and uncertainty diminishes. The index is forecast to grow 12.5 percent year-over-year in 2004. From the Q4 2002 to Q4 2003 the index is forecast to grow 10.2 percent. The three-year decline in yearly average stock price expected to end after 2003 will be only the third time since 1900 that average stock price declined three years in a row. The last such decline was in 1940-42. In 2000, the Manhattan area below 14th Street accounted for 7.3 percent of State private employment, and 14.9 percent of State private wages. This area also accounts for 50.6 percent of the State's securities industry wages. In the business services industry, 10.6 percent of the State's employment and 15.0 percent of the State's wages are below Manhattan's 14th Street. Securities and business services industries were the most affected by the attacks of September 11th. Wages statewide fell 2.6 percent in Q4 2001, the first decline since Q4 1994. 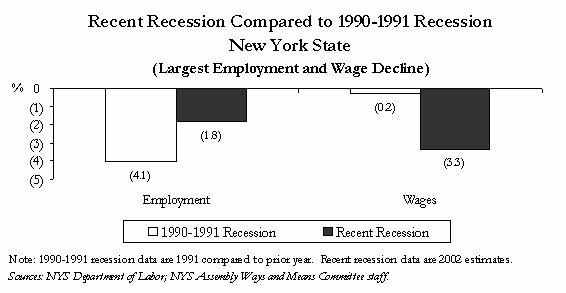 In 2002 New York State is estimated to have had its first annual decline in overall wages paid to workers since 1991. The decline would also be the largest in State wages in more than sixty years. Small businesses with fewer than 100 employees accounted for nearly half of the State's job losses. Of the jobs lost across New York State in Q4 2001: seven out of ten were in New York City; six out of ten were in Manhattan; and two out of ten were in Manhattan below 14th Street. The largest employment losses in New York City in Q4 2001 were in business services, the securities industry, wholesale and retail trade, and other service industries. Although the employment drop in Q4 2001 was severe in Manhattan below 14th Street, the wage drop was even more concentrated in this area. The entire aggregate drop in New York State wages in Q4 2001 can be attributed to the securities industry and business services, which is closely linked to the securities industry in New York City. When these two sectors are excluded, wages for all other sectors combined were up slightly. The securities industry-a vital element of New York's economy, particularly in Lower Manhattan-saw profits decline by more than 50 percent in 2001, and profits are estimated to have declined by 54 percent in 2002. In 2002, securities industry employment declined 9.4 percent from the previous year. Commercial property insurance premiums increased 74.4 percent in New York City in the year after September 11th, compared with 10.3 percent during the previous year. Thirty-four million square feet of office space were damaged or destroyed by the September 11th attack. Slightly over half of this office space was reopened by July 2002. Between August 2001 and August 2002, air transportation employment in New York City declined 16.5 percent. Airline traffic has also declined in the City since September 11th at a faster pace than the nation. This continued a long-term trend of New York City airline traffic lagging behind national growth. In Q4 2001, New York State's FIRE sector lost 16,900 jobs compared to the prior year or 71.1 percent of the 23,700 FIRE jobs that were created in the expansion of 1995-2000. New York State's manufacturing sector lost 66,600 jobs between Q4 2000 and Q4 2001. This is larger than the five-year loss of 64,200 manufacturing jobs between 1995 and 2000. A modest national economic recovery is expected to continue in 2003. The national recovery will be driven in part by a large swing in investment spending compared to 2001 and 2002. In addition, net export growth, though still not positive, will be less of a drag on economic growth than it was in 2001 and 2002. Continued rapid growth in federal defense and public security spending will also help to boost the economy during its recovery, though this will be countered by weakness in state and local government budgets. The continued recovery of the economy will be somewhat hampered by lower consumption growth in 2003 compared to 2002. The recovery will be broad, cutting across economic sectors, with services leading the way. Manufacturing will still continue its long-term decline, but as general economic conditions improve in 2003, the manufacturing sector will contract less rapidly and be less of a drain on the general economy. Business uncertainty on several fronts has been a drag on the economic recovery. This uncertainty is expected to gradually lift, helping to boost economic growth. Much of the uncertainty that has plagued the economy during this recovery comes from concern over whether a war will occur and what the outcome of that war will be. In a recent speech, Federal Reserve chairman Alan Greenspan said that uncertainties about a war with Iraq represent the biggest cloud hanging over the nation's struggling economy.1 The uncertainty regarding war comes less from concern about our ability to win as it does from concern over possible indirect impacts of the war. The most obvious of these impacts would be a sudden rise in oil prices from a reduction in supply. Other concerns include the potential cost of long-term occupation, possible deterioration in our relations with other countries, and the increased likelihood for terrorist attacks as a result of our involvement in a Middle East conflict. Ongoing fears regarding terrorism from September 11th and from frequent alerts of possible future attacks has contributed an additional air of uncertainty into the economy. With a weak worldwide market, stocks floundering, the Federal Reserve reluctant to cut rates any further, and little coming from the federal government that will truly provide short-term fiscal stimulus, the economy has struggled during this recovery. New York State has performed relatively poorly during the recession that started in 2001 for a number of reasons. The State obviously was particularly hurt by the September 11th attack. Due to a high concentration of the securities industry, the State has also been severely hurt by industry-specific difficulties. These difficulties are responsible in large part for the sharp estimated drop in wages during 2002. There are a number of reasons for the securities industry's problems. The recent scandals in financial markets have had a double impact. The first impact was from the loss in confidence in corporate accounting, which translated into a loss of confidence in stock valuations and resulted in a renewed decline of financial markets. But perhaps even more damaging was when the securities industry itself became the focus of concern. The bursting of the dot-com bubble and the resultant financial market decline (particularly the NASDAQ) was an early factor in the securities industry's problems. September 11th was also clearly an important component. As a result of these factors along with general market uncertainty, most sources of securities industry revenue have been sharply declining. Looking forward, New York will benefit like the rest of the nation from general improvement across sectors in the economic outlook. In general, the recovery is expected to continue to be weaker in New York State than the rest of the nation. Every recession is unique both in its cause and in the nature of the recovery, as a comparison of this recession with the 1990-91 recession illustrates. The primary causes of the 1990-91 recession were the persistent monetary tightening pursued by the Federal Reserve since mid-1988 and the Gulf War in January to February of 1991, which led to higher energy costs and a further decline in consumer confidence. Recovery from the recession was unusually slow. It was hampered by a credit crunch following financial regulatory reforms, as were demanded in the wake of the Savings and Loan Crisis of the late 1980s. As a result, both businesses and consumers were pinched. Business capital spending declined 3.6 percent from the peak to the trough and consumption spending declined 0.9 percent. On the other hand, the bursting of the dot-com and high-tech bubbles triggered the recession that began in 20013 after businesses made excessive investment spending in preparation for Y2K and overestimated the sustained demand for information technology services. The ending of perhaps the largest financial and economic bubble in recent history caused the recession that began in 2001. As a result, private businesses were left with excess capacity, unable to utilize low-cost investment opportunities provided by the Fed's monetary easing. Business capital spending declined 6.6 percent from the peak to the trough. The decline was exacerbated by the September 11th attack. Consumer spending was robust this time around, with consumers taking advantage of low interest rates and strong price growth in the housing market, which compensated for the loss they incurred in equity markets. Unlike during the 1990-91 recession, consumption spending increased 1.3 percent from the GDP peak to the trough. This recession was not just due to a shock, but also due to restructuring within certain segments significant to the economy. Growing concern for security issues has caused changes in transportation, insurance, government, and industries related to the nation's infrastructure. Investment banking is undergoing major changes due both to scandals and concerns about back-up facilities. High technology industries have restructured after a period of over-expansion. And some corporations in general are restructuring their financial reporting and corporate governance functions. As a result, reallocation of resources has acted to slow this recovery. The net result is that the recession that began in 2001 was milder than the 1990-91 recession (see Figure 2). Real Gross Domestic Product (GDP) declined 1.5 percent during the 1990-91 recession, while it declined only 0.6 percent during the most recent recession. However, general economic activity during the expansion phase has been rocky this time around. This appears to be due in large part to ongoing financial market uncertainty caused by corporate accounting scandals as well as increasing international tensions including threats of further terrorist attacks. 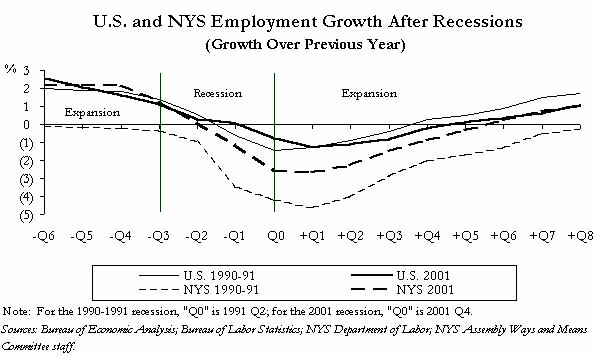 The impact of this recession on the New York State economy is also different than the 1990-91 recession. The decline in employment is expected to be milder than in the last recession. However, the decline in wages is actually more severe in the current recession (see Figure 3). This is due in part to declining variable compensation in the securities industry. 1 Jeanine Aversa, "Greenspan: War Threat Hurts Economy," AP Wire (Washington), February 11, 2003. 2 See the Auto and Durable Goods section of this report for further discussion. 3 Although the recession is most likely over, the National Bureau of Economic Research (NBER), the organization that dates recessions, has yet to announce an official ending date. It is important to note that NBER does not rely on GDP to date a recession, but rather relies on four monthly indicators other than GDP. Specifically, these indicators are: employment; personal income less transfer payments; sales in the manufacturing and trade sectors; and industrial production. These indicators generally have not performed as well as GDP recently. 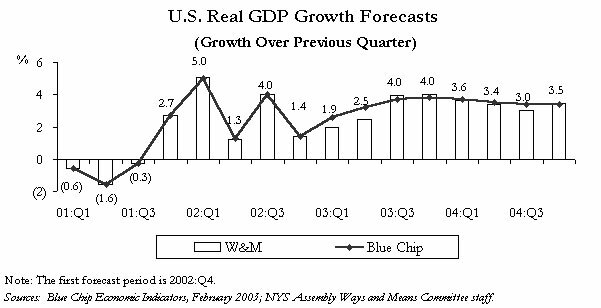 The NYS Assembly Ways and Means Committee staff forecasts that the national economy, as measured by Real Gross Domestic Product (GDP), will grow 2.5 percent during 2003 (see Figure 4). It is 0.1 percentage points up from the 2.4 percent growth estimated for 2002. GDP growth is expected to accelerate further in 2004. Overall, the national economy is forecast to be on the road to recovery from the recession that began in 2001. During 2001 the economy grew only 0.3 percent, the weakest since the 1990-91 recession, when real GDP declined 1.5 percent from the peak to the trough. On a quarterly basis, real GDP growth is expected to accelerate throughout 2003 and decelerate slightly during 2004 (see Figure 5). The NYS Assembly Ways and Means Committee staff forecasts that consumption spending will slightly decelerate year-over-year to 2.3 percent during 2003, down from the 3.1 percent estimated for 2002. It is forecast to grow 3.4 percent during 2004 (see Figure 6). Housing prices and refinancing activity are expected to deteriorate some, but only enough to have a small effect on consumption growth. Auto sales may not achieve their current record levels in 2003. However, unit sales data suggests that auto sales can still remain quite strong, particularly if interest rates remain low enough for the automakers to continue offering strong financing terms. Services consumption, the least volatile as well as largest component of consumption (about 56 percent of the total), is forecast to grow 2.5 percent year-over-year during 2003, accelerating a bit from 2002 and 2001. Nondurable goods consumption, the least income-sensitive component of consumption, is expected to grow 2.5 percent during 2003, slowing down a bit from the 3.2 percent growth estimated for 2002. Durable goods consumption, the most volatile as well as smallest component (about 14.5 percent of the total consumption), is forecast to decelerate to 1.7 percent year-over-year during 2003, after growing six percent or higher for several years in a row, including the recent recession (see Figure 7). A good part of the steady growth in durable goods consumption for the past two years can be ascribed to the unusually strong auto sales due to various incentives. In general, when components of GDP are discussed throughout this document, the numbers refer to real (inflation-adjusted) data. However, it is important to note that inflation for the components of consumption has behaved quite differently. Prices for goods, particularly durable goods, have been increasing much more slowly than prices for services, which have been rising about three percent a year over the past ten years (see Figure 8). Therefore, what is happening for nominal expenditures in the various components of consumption can be quite different from what is happening in real dollars. These price changes also have important implications for corporate profits. Firms, particularly those that produce goods, have been complaining of a lack of pricing power, which can hurt corporate profits while helping to lower inflation. Strong housing markets have aided consumption in this recession and recovery. As the largest single asset on the consumer balance sheet, rising home prices generate additional spending through what economists call the "wealth effect." Housing wealth has also been particularly accessible to consumers lately because low interest rates have spurred a refinancing boom that has allowed consumers to directly tap into their home equity. The lower rates and therefore lower payments from many recent refinancing transactions also help consumption by freeing up disposable income on an ongoing basis for other uses. Housing activity also spurs consumption by encouraging complementary purchases (such as appliances) soon after the purchase of a home. Consumption has remained remarkably stable despite the recent recession. Consumption has generally fallen less than other components of GDP during recessions and may have become even more stable recently.5 During this recovery, consumption growth is also expected to remain stable relative to other GDP components. Although consumption is expected to continue growing, there is little pent-up demand or other impetus for consumption growth to accelerate. 4 See "The Consumer" section of this report for further discussion. 5 See "A New Consumer" in The Consumer section of this report. The Ways and Means Committee staff predicts that investment spending will grow 5.2 percent year-over-year in 2003 and further accelerate to 8.0 percent in 2004, a strong recovery from the 10.7 percent decline recorded in 2001 and the mere 1.0 percent growth estimated for 2002 (see Table 1).6 The sharp drop in investment during this recession has led to cyclical growth in underutilized investment opportunities. Spending will rise as corporations exploit these opportunities in 2003 and 2004. This recovery in investment spending will be mainly due to a strong rebound after several consecutive quarters of decline in equipment and software investment and to a gradual build-up in inventories. 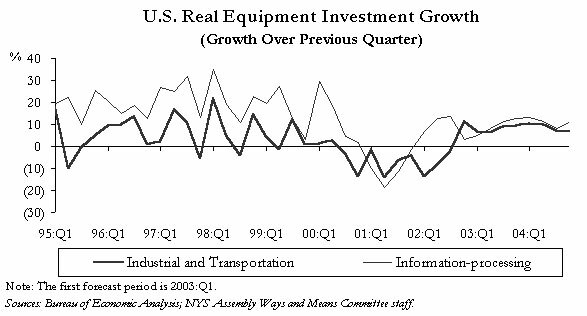 On the other hand, industrial and transportation equipment investment, which had declined for eight quarters in a row since Q3 2000, increased 11.2 percent in Q4 2002 (see Figure 9). Overall, equipment investment is expected to grow 7.1 percent year-over-year during 2003 and 10.5 percent during 2004, after falling 1.7 percent in 2002. 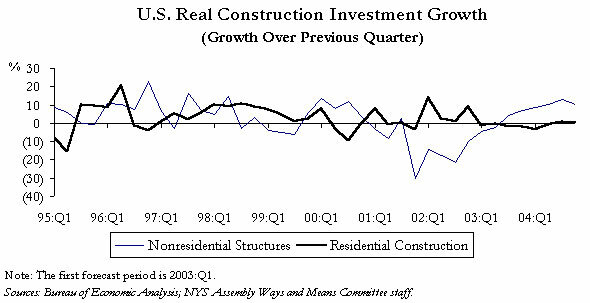 Nonresidential construction, which had declined for seven out of eight quarters since Q4 2000, is forecast to remain weak until an expected rebound begins in Q3 2003 (see Figure 10). This sluggish recovery in nonresidential construction is due mainly to idle or underutilized capital stock and rising office vacancy rates. Residential construction is forecast to rise 1.4 percent in 2003 as housing demand is expected to remain robust despite a slight rise in mortgage rates. As mortgage rates are expected to rise however, residential construction is likely to weaken toward the end of 2003. It is forecast to decline 1.1 percent in Q4 2003 compared to the same period a year ago. Residential construction is expected to decline 1.3 percent year-over-year in 2004. 6 The last time investment spending declined was during the 1990-1991 recession, when it fell 10.7 percent from the peak to the trough. 7 See "Industry and Production," in the Investment section of this report. 8 Average based on the last five years of data. 9 Information-processing equipment and software quality-adjusted prices have actually declined every year during the last decade. This decline was 3.6 percent in 2002 compared to the prior year. It is important to note however, that much of this drop has been in the form of quality improvements rather than changes in the actual selling price. To the extent that lower quality-adjusted prices affects the current selling price of a typical state-of-the-art unit, this category of spending will have a harder time experiencing nominal growth. At the same time, improvements in unit quality can motivate earlier replacement of obsolete units. Historically, the desire to buy new units has allowed information-processing equipment and software spending to experience double-digit growth in each of the four years prior to the recession. During the recession, spending in this category dropped dramatically. This has caused a build-up in information-processing equipment that is old and in need of replacement, which will help to drive spending growth in 2003. Due to more emergency spending bills and military buildup on account of Iraq and the War on Terrorism, federal spending increased 7.5 percent year-over-year during 2002. It is forecast to slow down to 7.0 percent in 2003 and further down to 1.5 percent in 2004 (see Figure 11). 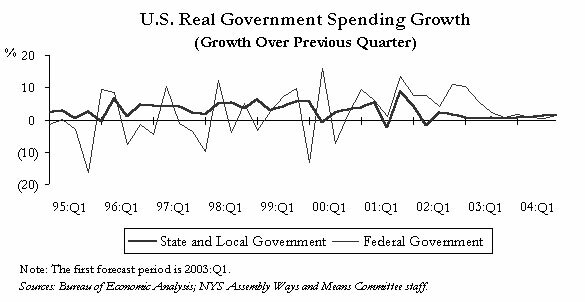 On the other hand, state and local government spending is forecast to grow a mere 0.9 percent in 2003 and 0.9 percent in 2004 in the midst of state revenues falling short of expenditures in recent quarters. 10 Aggregate government spending is forecast to grow 3.1 percent in 2003 and 1.1 percent in 2004, quite a bit lower than the 4.4 percent expected in 2002. The largest change to the federal government budget outlook comes on the revenue side from the president's tax cuts and the slowing economy. The largest portion of the tax cut, targeted to taxpayers with the greatest incomes, has not yet taken effect. While the current budget shortfall can be attributed to economic decline, future years are expected to show deficits mainly from tax law changes. 10 State and local governments, facing significant revenue shortfalls, will be decreasing spending in many areas over the forecast period. However, this is expected to be more than offset by growing expenditures in some areas of state and local government that are not so easily controlled. One report estimates that state spending will go up 1.3 percent in Fiscal Year 2003, see the National Governors' Association and the National Association of State Budget Officers, The Fiscal Survey of States, November 2002. Certain state and local expenditures naturally move inversely with economic growth. On the positive side, these categories of spending contribute to a natural countercyclical state and local fiscal policy. On the other hand, budgets can be even more difficult to balance during a downturn. Three categories of state or local spending that often are large and increase when the economy is bad are public assistance, Medicaid, and corrections expenditures. Both public assistance and Medicaid have formulas for eligibility that include the economic situation of the applicant. Therefore, the number of people in these programs naturally rises when the economy declines and unemployment rises. In New York State, counties pay a portion of both Medicaid and public assistance expenditures. Corrections spending is tied to the crime rate which in turn is tied to economic factors. However, at this particular time, non-economic factors have had more of an impact on the crime rate, reducing prison populations. In all three of these cases, there is typically a lag between the general economic decline and the rise in expenditures. Also, in all three of these cases, cutting back on expenses cannot generally be done without changing the rules of the programs. Though Medicaid is generally the largest of these programs there is little evidence that states did large-scale cutbacks in the most recent fiscal year to Medicaid in order to balance their budgets. In fact, a recent study by the Rockefeller Institute found that states are typically only attempting to cut back on Medicaid expenses by one to four percent despite budget shortfalls. See Courtney E. Burke and James Fossett, "Is Medicaid Retrenching," (paper presented at the New York State Network for Economic Research Conference, Rockefeller Institute of Government, Albany, New York, December 4, 2002). However, next year might be quite different, with large Medicaid cuts entirely possible. 11 Bob Davis and Greg Ip, "The 'If' Factor: Bush Stimulus Package Needs Many Assumptions to Pan Out," The Wall Street Journal, January 8, 2003, p. A1. 12 "Bush Tax Cuts Come Under Fire from Economists," Reuters News, February 10, 2003. 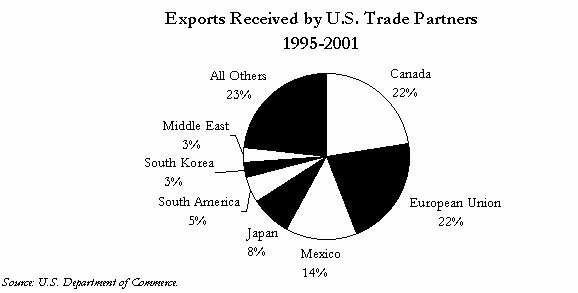 Both exports and imports declined during the recession that began in 2001. Reduced investment and slower consumption in 2001 growth resulted in fewer imports. The weakening of the global economy led to fewer exports. The Ways and Means Committee staff forecasts that exports will grow 3.7 percent year-over-year in 2003 and 7.3 percent in 2004, after falling 1.5 percent in 2002 (see Figure 12). This will be driven by higher exports due to an improving international economic outlook. Imports are forecast to grow 5.9 percent year-over-year in 2003 and 7.4 percent in 2004, following 3.7 percent growth in 2002. Net exports, defined as exports minus imports, will decline in 2003 and 2004, negatively affecting real GDP. 13 See "The Value of the U.S. Dollar" in the Financial Sector section of this report. 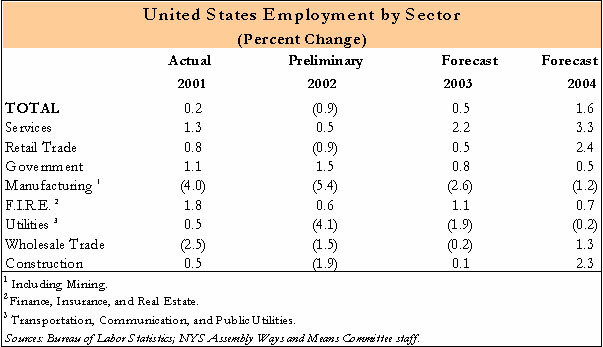 The Ways and Means Committee staff predicts national employment will grow 0.5 percent in 2003 and 1.6 percent in 2004, following a decline of 0.9 percent in 2002 (see Figure 13). Unemployment, which generally lags changes in economic growth, is estimated to peak at 6.1 percent in Q2 2003 and then gradually decline, bringing the annual average to 6.0 percent in 2003, slightly higher than the 5.8 percent average for 2002. It is expected to decline to 5.7 percent in 2004. Government employment is forecast to continue to grow in 2003 at 0.8 percent and 2004 at 0.5 percent, following the growth of 1.5 percent for 2002. This is due to an expected strong growth in federal government employment, despite weak growth in State government employment. Though manufacturing and utilities industries are forecast to continue declining in 2003 and 2004, other industries, in particular retail trade and services industries,14 are expected to see positive growth in 2003 and 2004 (see Table 2). 14 Definitions of sectors and their subcategories are changing to the new NAICS classification. For more information, see the NAICS section in Appendix A of this report. The Federal Reserve cut the federal funds rate target by 50 basis points to 1.25 percent at its November 6, 2002, meeting. The cut came after the Fed had remained neutral since December 2001. It is assumed for this forecast that the Fed will not make any further rate reductions nor begin raising rates until the early fall of 2003. The three-month Treasury bill rate is forecast to remain stable at 1.3 to 1.4 percent through Q2 2003 then rise to reach 1.8 percent in Q4 2003 and 2.7 percent in Q4 2004. The ten-year Treasury bond rate is forecast to remain at or below 4.6 percent until the end of 2003 and then rise to 5.2 percent by the end of 2004 (see Figure 14). While short-term interest rates have fallen in response to Federal Reserve policy, long-term rates have not declined as sharply. While the three-month Treasury bill rate has declined almost five percentage points since late 2000, the ten-year Treasury bond yield has declined by about half this amount. This has been an impediment to the economic recovery process. The Treasury yield spread, measured by the difference between the ten-year Treasury bond and the three-month Treasury bill, is an indicator of how the short-term rate is expected to change in future years, with higher spread numbers indicating that short-term rates are expected to rise. The yield spread turned positive in 2001 and remained high in 2002. This may indicate the expectation of an impending recovery or the expectation of higher budget deficits. There has been much talk about low mortgage rates. While mortgage rates are in fact very low, the recent decline in mortgage rates has been similar in magnitude to the decline in long-term Treasury bonds. However, the low mortgage rates have received more attention because they have sparked a refinancing boom while low long-term rates in other areas have not had a comparable effect on business investment activity. The purchase and sale of assets other than short-term treasury securities by the Federal Reserve affects the interest rate on long-term securities, and was done by the Federal Reserve during the 1940s and the early 1960s. The Federal Reserve can also trade in private securities, but its capacity to do so is restricted by law.16 Through the discount window, the monetary authority can affect the rate at which funds are available to banks. If the Federal Reserve accepts a wide range of assets as collateral when it lends, then the rates on all these assets can be influenced. If the Federal Reserve trades in foreign debt, then it can also affect the exchange rate; currently, however, the Treasury formulates exchange rate policy. Further, the Federal Reserve can, in collaboration with the Treasury, buy government debt that is issued to finance a government purchase or implement a tax cut. Even when the supply of money is increased, however, nominal expenditures may not increase if business conditions are poor, or confidence levels are low. In such situations, fiscal policy may be more effective at stimulating the economy. 15 This paragraph draws on remarks by the Federal Reserve chairman, Alan Greenspan, before the Economic Club of New York in New York City on December 19, 2002; also see Ann Marie Meulendyke, "U.S. Monetary Policy and Financial Markets" Chapter 2, The Federal Reserve and U.S. Monetary Policy: A Short History, (Federal Reserve Bank of New York: 1998); and "Deflation: Making Sure "It" Doesn't Happen Here," (remarks by Federal Reserve governor Ben S. Bernanke before the National Economists Club, November 21, 2002). 16 For example, the Board of Governors of the Federal Reserve can invoke the power to make Individual Partnership and Corporation loans directly to the private sector, but only in an emergency. See "Deflation: Making Sure "It" Doesn't Happen Here," (remarks by Federal Reserve governor Ben S. Bernanke before the National Economists Club, November 21, 2002). Due in large part to a big decline in capital depreciation in Q4 2001, economic profits rose a whopping $124.2 billion or at an annual rate of 94.4 percent from the previous quarter. This large increase in economic profits came after falling six out of seven quarters during the years 2000-01. With all other factors held constant, an increase in economic profits leads to a one-to-one increase in accounting profits. But in Q4 2001, the quarter right after the September 11th terrorist attacks, U.S. corporations were allowed to write off $185.1 billion, which reduced accounting profits by a similar amount. Accordingly, despite a large increase in corporate profits on an economic basis, corporate profits on an accounting basis declined in Q4 2001, as the amount of bonus depreciation far exceeded the unusually large gain in economic profits. In the first three quarters of 2002 however, while economic profits turned to decline again, accounting profits rose for three quarters in a row, after falling quite steadily for six out of the eight quarters of 2000-01. This disparity between economic and accounting profits resulted from the fact that the amount of bonus depreciation declined by $67.5 billion in the first three quarters of 2002, which pushed up accounting profits more than enough to counterbalance the loss in economic profits. Corporate profits on an accounting basis declined 1.5 percent year-over-year during 2002, following a decline of 14.3 percent in 2001. Profits are forecast to rise 10.0 percent during 2003 and 16.2 percent during 2004 due to robust growth in productivity and a gradual decline in bonus depreciation. 17 Accounting profits are derived from economic profits, which are computed based on net national output. Since net national output is gross national output minus capital depreciation, a decline in capital depreciation, with all other factors held constant, result in a larger net national output and a larger economic profits. Two adjustments are made to economic profits to arrive at accounting profits: one is capital depreciation adjustments and the other is inventory valuation adjustments. The United States Congress passed the Job Creation and Worker Assistance Act of 2002 on March 9, 2002, which provides businesses with a 30 percent extra depreciation adjustment (sometimes referred to as bonus depreciation) for properties placed in service after September 10, 2001, and before September 11, 2004. The average annual amount of depreciation adjustments that corporations were allowed to write-off was only about $17.2 billion before Q4 2001, when the amount surged more than ten-fold to $185.1 billion. This write-off amount has gradually declined and was $117.6 billion in Q4 2002. 18 For example, while the national income and product accounts (NIPA) published by the Bureau of Economic Analysis treats stock options as an expense, most listed companies do not. That corporate practice may have boosted profitability in the late 1990s, as stock options instead of cash were issued at a record level as a major form of compensation. For more details, see "Fear, Then Greed - Stockmarket Turmoil," The Economist Newspaper Limited, July 27, 2002, p. 60. The stock market, measured with the S&P 500 index, declined 16.5 percent year-over-year in 2002, following a 16.4 percent decline in 2001. Another year-over-year decline in the stock market is forecast for 2003. However, this is primarily due to a high stock price in the first half of 2001 relative to the price in the second half of 2001, which brought the average price for 2001 up above the average for 2002. On a quarterly basis, the stock market is forecast to increase every quarter in 2003 compared to the prior quarter. The fourth quarter of 2003 will have price growth of 10.2 percent compared to the same quarter in the prior year. This rebound is due to improving corporate profits and diminishing uncertainty. The S&P 500 index is forecast to grow 12.5 percent year-over-year during 2004. There is no generally accepted definition of a financial "bubble." Therefore there is no consensus as to how many prior stock market bubbles we have experienced. Probably the only historic period prior to the current one that experts would generally agree was a financial bubble would be the run-up in stocks prior to the 1929 crash that began the Great Depression. This bubble was followed by a two-year, ten-month stock market decline, which was a decline in value of 84 percent. Following this decline, the market took a full twenty-five years to return to the level it had been prior to the crash. The Ways and Means Committee staff forecast for overall national economic growth in 2003 is 2.5 percent, 0.2 percentage points lower than the Blue Chip Economic Consensus forecast. Economy.com's forecast is 2.4 percent and the Global Insight (formerly DRI-WEFA) forecast is 3.0 percent (see Table 3). The February 2003 Blue Chip Consensus Forecast is the average of fifty-three forecasters. Forty-two of these forecasters, or 79 percent, have 2003 GDP growth forecasts at least as high as the Committee staff forecast. The Committee staff forecasts 3.5 percent economic growth for 2004, which is slightly lower than the Blue Chip Economic Consensus and the same as the 3.5 percent forecast of the Economy.com. Global Insight's 4.6 percent forecast for 2004 is 1.1 percentage points higher. The February 2003 Blue Chip Consensus forecast for 2004 is the average of fifty forecasters. Thirty of the forecasters, or 60 percent, have 2004 GDP growth forecasts at least as high as the Committee staff's forecast. The New York State economy lost 224,900 jobs or 2.7 percent in Q1 2002, compared to the same period a year ago (see Figure 16). The loss of employment in Q1 2002 is the largest since Q1 1992. 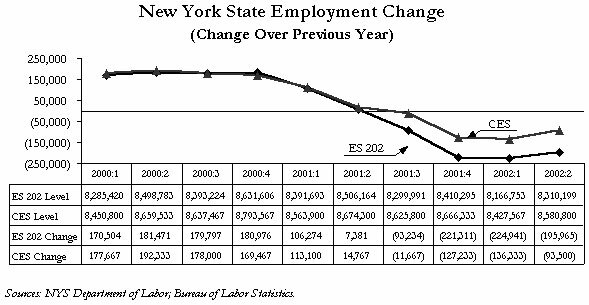 The NYS Assembly Ways and Means Committee staff estimates that the State economy will continue to lose jobs (over the same period of the previous year) until Q1 2003, resulting in a year-over-year decline of 155,400 or 1.8 percent in 2002. It will be the worst decline since 1991 and 1992, when employment declined 4.1 percent and 1.9 percent respectively (see Figure 17). Except for the government sector, every industry (at the one-digit Standard Industry Classification level) is expected to lose jobs at an annual rate ranging from 1.0 percent for the services sector to 8.1 percent for the manufacturing sector (see Table 4). Compared to the nation, State employment declined at a faster rate during the recent recession as well as during the 1990-91 recession. The decline in State employment during the recent recession, however, is smaller and slower than during the 1990-01 recession. The State economy is expected to gain jobs at a faster rate than it did after the 1990-91 recession, but slower than the nation. New York State employment is forecast to rebound during 2003, growing 0.4 percent year-over-year. At a disaggregated level, payroll jobs are forecast to continue to decline in manufacturing at 3.5 percent, and transportation and utilities at 3.1 percent during 2003. State employment is further forecast to grow 1.6 percent year-over-year during 2004 (see Table 4). Compared to the nation, New York State grew slower than the nation in every single sector during 2002. New York's growth was particularly weak relative to the nation in transportation and utilities (3.2 percentage points less than the nation), manufacturing (2.7 percentage points less than the nation), and FIRE (3.8 percentage points less than the nation). In 2003, New York is still expected to grow more slowly than the nation in most sectors, with construction employment expected to grow faster in the State. When compared to other states, New York is ranked 41st for employment growth, with a negative rate of 1.1 percent. 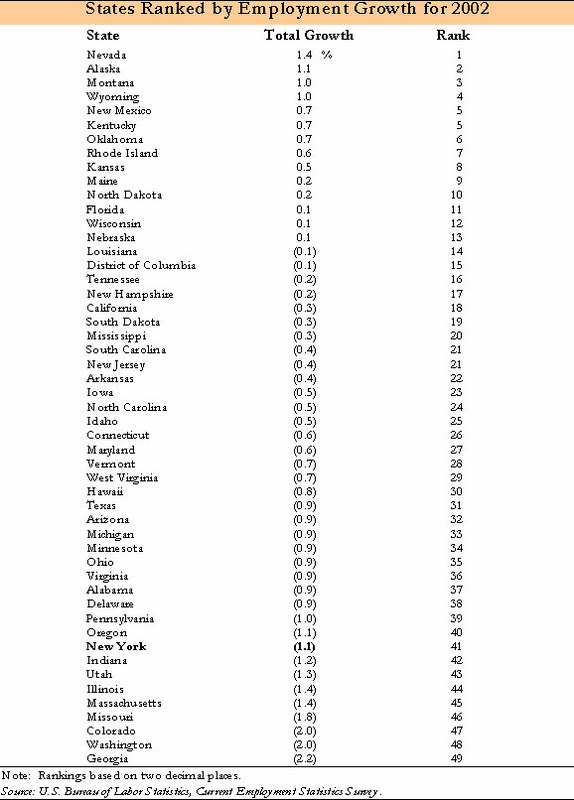 Nevada had the highest employment growth during 2002 at 1.4 percent and Georgia had the worst with a negative 2.2 percent (see Table 5, page 27). In the manufacturing sector as a whole, wages increased $18.2 billion in this period, while employment fell 574,000. Employment also fell in many industries that paid below average wages: apparel, general merchandise stores, food, and kindred products are examples. Further, there were considerable employment gains in high-wage industries such as the securities industry, engineering, accounting, and other professional services, as well as legal services. 19 New York City business services average wage in 2000 was $53,900, which was higher than the statewide average wage of $45,400 and the statewide business services average wage of $44,800. The year-over-year growth rate in State wages has slowed quite rapidly since Q1 2001 when wages grew 8.7 percent. The first quarter of 2002 was particularly bad with a decline of 8.1 percent (see Figure 18). Compared to other states, wages in New York State grew less than about half the states in 2001. New York is ranked 24th, with 2.4 percent growth. Wyoming grew fastest at 6.9 percent. 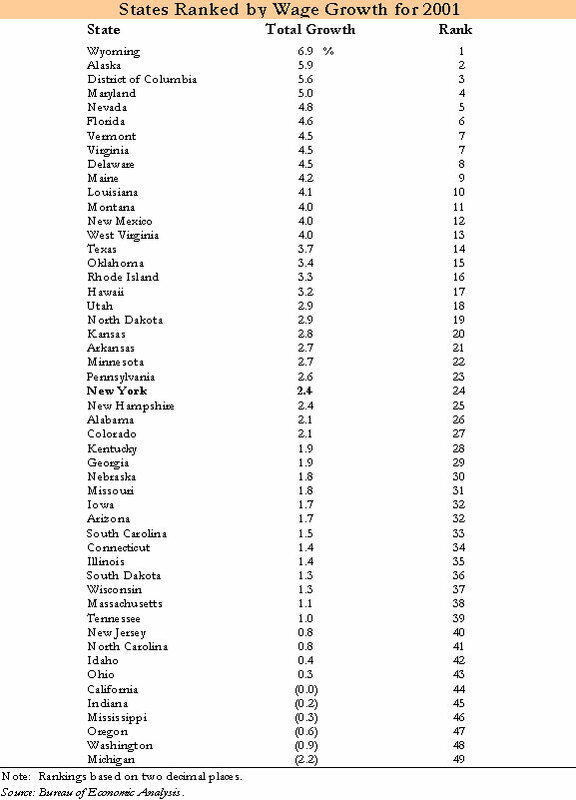 Michigan had the largest decline of 2.2 percent (see Table 6 on page 28). The FIRE sector is particularly important to the New York State economy. The State's share of the nation's wages has been declining in all other sectors. In the same period population growth slowed. FIRE is the only private sector that showed an increase in wage share, from 17.7 percent of the nation in 1973 to 19.8 percent in 2001, suggesting that FIRE may be more important to the State now than ever (see Figure 19). 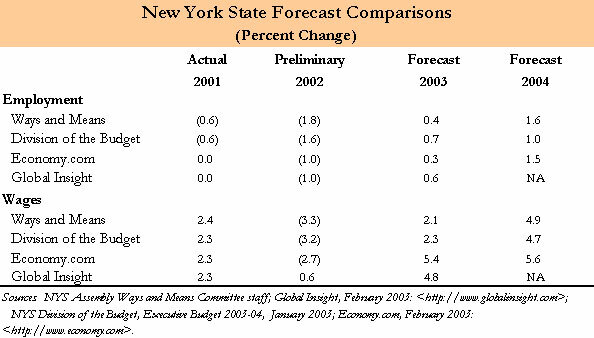 The Ways and Means Committee staff estimates that State wages continued to fall (over the same period of the previous year) throughout 2002. Overall, 2002 is estimated to have seen a year-over-year decline of 3.3 percent, the worst since 1938. Compared to the nation, State wages declined at a faster rate during the recent recession as well as during 1990-91 recession (see Figure 20). The decline in State wages during the recent recession was more pronounced than during the 1990-91 recession. Recovery in State wages is expected to be significantly slower than it was during 1990-91 recession and also compared to the nation. This is due in large part to the fact that the State financial sector, which grew more and more important to the State economy in terms of its wage share,20 got hit disproportionately harder as a result of the stock market bubble bursting, the September 11th terrorist attack, and corporate accounting scandals. The Committee staff forecasts that State wages will grow 2.1 percent year-over-year in 2003 and 4.9 percent in 2004. Although this is a significant improvement from 2002, it is still sluggish compared to historic growth rates. This return to growth is the natural wage response during recovery, even a mild recovery, following the sharp decline in wages during 2002. This wage growth will be driven by both rising employment and by modest increases in the typical base wages paid to employees. These factors in turn will be driven by general economic recovery across sectors, with every private sector in the State showing improved employment growth in 2003 compared to 2002. Variable compensation is the most volatile component of State wages and plays a particularly important role in the movements of financial sector wages over time.21 The Committee staff estimates that State total variable compensation, which was $44.9 billion or 11.4 percent of total State wages in 2001, declined $11.3 billion or 25.2 percent year-over-year during 2002. It is forecast to decline further at an annual rate of 8.3 percent during 2003 but rebound 8.6 percent during 2004 as securities industry profits as well as corporate profits are expected to improve. The securities industry, which accounted for 45.3 percent of State total variable compensation in 2001, was hit hardest in 2002. The Committee staff estimates that the securities industry's variable compensation dropped $8.2 billion or 40.3 percent in 2002 and will drop $2.2 billion or 18.2 percent in 2003. It is forecast to grow 11.6 percent year-over-year in 2004. 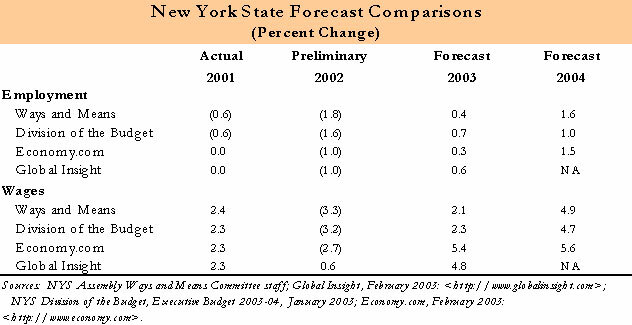 The New York State forecast for 2003 depends centrally on our assumptions concerning the economic recovery of New York City. The nature of the downturn was particularly severe in 2002 in New York City. In fact, New York City wage growth dramatically decelerated from 19.6 percent in Q1 2000 to positive 10.8 percent in Q1 2001 to negative 12.8 percent in Q1 2002; wage growth was 32.4 percentage points less in Q1 2002 than in Q1 2000. Employment and wage growth in the State over the medium-term will be conditional on the efforts to revitalize lower Manhattan. 20 The securities industry's share in New York State total wages and salaries more than doubled from 5.0 percent in 1990 to 12.4 percent in 2001. 21 There is no known series of data for state or national variable compensation. The NYS Assembly Ways and Means Committee staff estimates variable compensation based on seasonal variations in wage patterns. These seasonal patterns are broken down by sector (at the four digit SIC level) to improve the precision of the estimate. The growth in this variation over time is also accounted for in the estimate. Since this estimate is based on seasonal variation, it may underestimate bonuses and commissions that come at frequent intervals throughout the year. It also may underestimate stock options to the extent that they are exercised throughout the year. On the other hand, in some cases non-variable pay may be included in variable compensation if there are regular seasonal patterns (such as if overtime regularly occurs in a certain quarter). Therefore, variable compensation contains high uncertainty-even in terms of the actual history. 22 Global Insight and Economy.com use the employment data (BLS 790) compiled by the Bureau of Labor Statistics and the wages and salaries data compiled by the Bureau of Economic Analysis. The NYS Division of the Budget and the NYS Assembly Ways and Means Committee staff use the Covered Employment and Wages data (ES 202) from the NYS Department of Labor. 23 The 2001 wage growth difference between the NYS Division of the Budget (DOB) and the NYS Assembly Ways and Means Committee staff is due to the fact that DOB made its own adjustments to 2000 and 2001 ES 202 wage data. It is important to note that there is greater ambiguity in the current environment than in typical forecasting periods. Each recession is unique and there is still a great deal of uncertainty regarding what shape the recovery will take, with a distinct possibility still existing that the economy will stall and again enter negative territory. Even if evidence of an economic recovery becomes strong in the near future, stock market performance may be hindered by concerns regarding accounting practices. There has been a breakdown of trust in financial markets due to these scandals. Confidence in the market is expected to gradually return. However, the market may be fragile for quite some time and investor trust will be more easily shaken by negative news, particularly regarding corporate conduct. There is still a risk of a continued stock market decline, even aside from any corporate accounting issues. Some economists argue that stocks are still overvalued based on historical price-earnings ratios.24 The price-earnings ratio for the S&P 500 peaked in December 1999 at 44.2 (see Figure 21). Since that time, prices have dropped bringing the ratio down to around 23. However, this is still very high by historical standards; between 1960 and 1990 this ratio averaged 15. This suggests that stocks may still be greatly overpriced and a renewed decline in the market could bring the country into recession again.25 As the economy recovers, if the Federal Reserve raises interest rates, rising rates could also reduce stock prices. A new terrorist attack could also have a major impact on the economy, both directly and through indirect changes in consumption and investment behavior. War on Iraq also presents a foreign policy risk. Such an attack could lead to a rapid rise in oil prices and cause a negative supply shock to the economy. Another growing concern is over the solvency of financial institutions in the mortgage industry, particularly Fannie Mae. Some concern has occurred, as Fannie Mae depends on lower mortgage rates to spur demand. The cutting of interest rates by the Fed raises questions about the sustainability of these rates.26 Some feel that Fannie Mae is seeking growth, with little or no regard for risks related to the company's dependence on changes in the interest rate.27 The insolvency of Fannie Mae would have dire consequences not only on the housing market, but also for investor confidence in general. A bill signed into law in November 2002 will provide government backing for terrorism insurance and thereby reduce much of the uncertainty faced by insurers and businesses regarding the risk of terrorism. Proponents have argued that the bill will help reinvigorate construction activity. However, a study by the Congressional Budget Office suggests that construction may not have suffered that greatly as a result of the lack of terrorism insurance after the September 11th attack.28 In addition, insurers do still face significant uncertainty regarding the risk of terrorism. Part of this uncertainty is caused by limitations in government compensation under the new legislation including high insurance industry deductibles before reimbursement begins, exclusions on domestic terrorism, and other limitations (such as exclusions in workers compensation coverage for some large employers). In addition, the uncertainty in the risk of terrorism itself still has reinsurers unsure how to price these policies. Ultimately, the insurance industry may still set high prices for terrorism coverage, which may have a continued negative impact on investment decisions. The possibility of a weaker world economy also presents a downside risk for our forecast. Currently, the greatest risk to American trade partners lies in Latin and South America. The timing of renewed investment growth is a risk to the forecast. It has been assumed here that investment growth will return in time to make up for any possible weakness in consumption growth. But if consumption declines before investment returns, the economy will suffer. Concern about growing deficits could present a risk to the forecast. Investors' expectations of high deficits due to current fiscal policy could raise long-term rates and therefore hinder economic growth. Despite aggressive monetary policy, the economy has been slow to turn around. There are limits to the effectiveness of monetary policy. Long-term rates are determined by market forces, and banks control how much money ultimately gets into the economy by controlling lending standards. In addition, there is a limit on how low the rates controlled by the Federal Reserve can go. Therefore, if the economy continues to deteriorate, additional monetary policy may not be effective at turning the economy around. It should be noted that the biggest risks for the nation are from war (and its impact on oil prices), a terrorist attack, or another round of corporate scandals. None of these events can be accurately predicted, making forecasting in this period particularly difficult. In addition, this uncertainty is in itself a risk to the forecast since it can hold back investment and spending in general. 24 For example, Robert Shiller as quoted in "How Far is Down," Economic Focus, The Economist Newspaper Limited, July 27, 2002. 25 It should be noted that there might be some legitimate reasons for the price-earnings ratio to be higher than historical norms. This ratio is partially determined by earnings growth. Therefore, if investors are anticipating higher-than-historical earnings growth then the price-earnings ratio should be higher than average. High growth may be reasonable in the long-term due to increased productivity (see the productivity section beginning on page 61 of this report) and in the short-term because profits took a large hit during the recession (in fact the current forecast includes an expectation of rapid profit growth). A high price-earnings ratio may also be sustainable if the nature of demand by investors has changed. The demand for United States investment instruments has risen over time and this could lead to a lower required return for those investments. In addition, the required return for stocks is also driven by a risk premium; if investors become less risk-averse, the required risk premium goes down and the price-earnings ratio goes up. 26 John Koller, The Valueline Investment Survey, Fannie Mae Profile, November 29, 2002, p. 2149. 28 The study points to a survey of banking lending practices after the attack showing that banks had not tightened their lending requirements for high-risk properties and that the commercial construction data does not show any pronounced effect from the lack of terrorism coverage, see The Congress of the United States, Congressional Budget Office, Federal Reinsurance for Disasters, September 2002. There is an upside to the current stock market situation. Investors may regain their lost confidence and propel stock values back towards their recent peaks. There is also an upside potential to the uncertainty regarding consumer spending. If consumer spending rebounds more rapidly, the economy could perform better than assumed in this forecast. A war with Iraq could have some positive economic impact due to fiscal stimulus through a large, unexpected spending increase. The reinvigoration of the economies of the nation's primary trading partners, particularly the European Union, Canada, and Japan, could result in stronger-than-expected export growth and, hence, stronger GDP growth. A weaker than expected dollar would also improve net exports, particularly by reducing imports. The uncertainty regarding variable compensation is a major risk to the State forecast. Variable compensation has been highly volatile. It is also highly focused in certain sectors, particularly Wall Street. How these industries adjust their compensation plans to the decline in the stock market and securities industry profits, in what form bonuses are paid, and when stock options will be exercised are all difficult to predict. The behavior of Wall Street and the finance, insurance, and real estate (FIRE) sector in general is a risk to this forecast. New York is particularly sensitive to the performance of the FIRE sector and recent events have highlighted the level of uncertainty for this sector in particular. The securities industry still faces continued restructuring and the potential for some firms to leave New York. However, the City may be an attractive enough place to live and do business in order to retain many of these firms. Potential relocation of securities firms presents a risk to the forecast. Four financial regulatory agencies suggested relocation of financial firms as backup arrangements with sufficient out-of-region staff, equipment, and data to recover their critical activities in a reasonable time. This may add to industry costs. But more importantly, it could take some key securities industry employment out of New York State, depending on where firms choose to relocate. The national economy is one more risk to the New York State forecast. If the national economy slows down more than we have predicted, then our forecast for the State will have been overly optimistic. Any further negative stock market correction could have a similar negative impact on the State economy. A second terrorist attack in the State could cause major disruption to an already-damaged infrastructure, and possibly have a large adverse effect on tourism and the relocation decisions of both residents and businesses. 29 Office of the Comptroller, the City of New York, "One Year Later: The Fiscal Impact of 9/11 on New York City," September 4, 2002. 30 Pallavi Gogoi, "Insurance: So Many Disaster Areas," BusinessWeek, January 13, 2003. Several factors present a possible upside potential to the New York State forecast. Bonuses could be stronger despite the decline in securities industry profit if firms decide that they still need to maintain high bonuses to retain their key employees. In addition, stronger-than-expected corporate profits could lead to faster stock market growth than predicted, producing in turn higher profits on Wall Street, higher bonus income, higher stock options, and higher capital gains. Since the forecast assumes little actual rebuilding underway in 2003, the positive stimulus from rebuilding Manhattan could be stronger than expected. A better-than-expected national economy would also improve conditions in the State economy. Looking longer term, job growth is anticipated to trickle-through the State's economy from the establishment of several new high-tech initiatives throughout the State. At the Center for Excellence in Nanoelectronics in Albany, construction of a $400 million next-generation computer chip research and development (R&D) center has begun. A $300 million semiconductor tool R&D center will soon be established in Albany as well. The area will continue to be an attraction for further nanoelectronic development, such as the recent partnership between IBM and Advanced Micro Devices, which has launched a $2.5 billion advanced computer chip development site in East Fishkill. The potential for similar growth is also present at other Centers for Excellence, Strategically Targeted Academic Research (STAR) Centers, Empire Zones, and Advanced Research Centers. Moreover, housing has a significant economic impact on consumer spending. 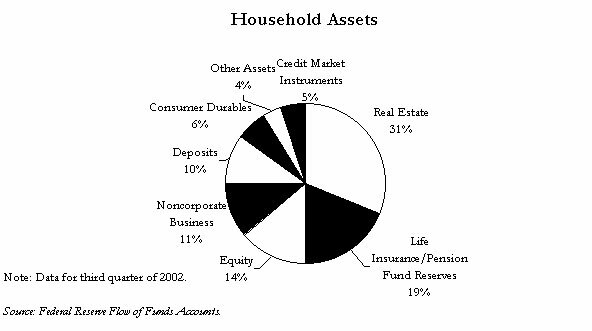 Accounting for roughly thirty percent of the average household balance sheet, housing is the most important single asset (see Figure 22). Although income is the dominant factor, changes in asset prices also have an influence on consumer spending through a wealth effect. When there is an increase in net wealth due to an increase in an asset price, some of it could be converted either to consumer spending or to another form of asset. In 2002 housing was key to economic recovery, both cushioning the effects of recession and leading the nation to recovery. Housing production (fixed investment on residential construction) grew 3.9 percent in 2002. Weakness in the equity market also continues to boost sales, as households elect to put their money into the perceived safety of the real estate market. A low inventory of unsold homes is another important factor of the housing strength. Demographic forces such as population growth have led to new households being formed at an annual rate of more than one million per year projected for 2000 through 2010.34 This rate of growth is expected to continue to fuel housing demand for the next decade. Due to the strength of the housing market, prices of homes have continued to rise even as the economy stumbled (see Figure 24). The median existing home price grew at a year-over-year growth rate of 7.1 percent in December 2002. Up until 1996, housing wealth was larger than stock wealth. But, with rising stock prices in 1996, stock wealth started exceeding house wealth. Households' home value started to again overtake its stock value in 2001, the first time since 1996 (see Figure 25).35 Despite the stock market decline, housing wealth probably has a larger effect on consumer spending than the stock market since the appreciation of residential real estate affects more households than the decline in stock prices and because real estate is less volatile. The total net wealth effect on consumption from financial gains is three to five percent, while for capital gains realized from the sale of homes it is ten to fifteen percent.36 In other words, people tend to spend about three times as much from housing wealth gains as they do from financial wealth gains. The Assembly Ways and Means Committee staff expects the cash-out amount from refinancing to drop. This will have a direct negative impact on consumption spending. However, according to recent reports, refinancing activity is expected to continue with slightly lower volumes in 2003.37 Some of the continued activity will be due to homeowners who refinance their mortgage and cash-out a second time due to housing price appreciation or because their previous refinancing was at a higher rate. In 2002, the actual cash-out amount was approximately 0.8 percent of total consumption expenditures, but not all of the money was put into spending in the near-term. Since the total amount of cash taken out of homes and used for consumption is less than 0.8 percent of consumption, a moderate decline in cash-out activity may have an impact of only 0.1 percentage point or less on consumption growth. With continuing housing price appreciation, there has been some speculation about the possibility that the housing market may suffer from a decline in prices. However, many economists view this as highly unlikely. Alan Greenspan, the Federal Reserve chairman, (in April 17, 2002 testimony to Congress) pointed out that housing price appreciation does not involve speculative fervor.38 In addition, Chairman Greenspan noted that opportunities for successful arbitrage are quite limited since housing markets are localized. In other words, it is more difficult and less common to make frequent trades in housing properties to make a quick profit than it is for financial assets. This trading activity often drives market bubbles. Housing starts increased 6.4 percent in 2002 above the 2001 rate (see Figure 26). Throughout 2002, housing starts were relatively high for each month compared to 2000 and 2001 except in April and July. 31 The construction of 1,000 single-family homes generated 2,448 jobs in construction and construction-related industries (e.g., manufacturing: 597 jobs; trade, transportation, and services: 675 jobs; and mining and other: 51 jobs), approximately $79.4 million in wages, and more than $17.8 million in federal, state and local tax revenues and fees in 1996, see "Housing: the Key to Economic Recovery," (National Association of Home Builders, 2002). 32 Average for 13 quarters; from Q1 1995 to Q1 1998, according to the 2002 estimate of the National Association of Homebuilders. 33 The percentage of people who have increased their loan when refinancing by at least five percent is used as a proxy for those who have cashed out, see "Freddie Mac's Cash-Out Refinance Report," FAQ page: (http://www.freddiemac.com/news/finance/cashout_faq.html). 34 Using 1996 projections updated with 2000 Census results, Bureau of the Census. 35 Stock wealth here differs from the amount used in Figure 22 due to alternative definition of ownership by households. In order to fully capture all stock wealth, the number used here includes stock indirectly held by a household such as stock in life insurance companies, private pension funds, mutual funds, etc. The alternative definition is used here to fully capture all stock wealth, while in Figure 22 assets are divided into categories based on what households directly own. 36 Federal Reserve Board chairman Alan Greenspan's opening remarks at a symposium sponsored by the Federal Reserve Bank of Kansas City, Economic Policy for the Information Economy, August 31, 2001. Other sources also find the household wealth effect is more powerful, see Karl Case, John Quigley, and Robert Shiller, "Comparing Wealth Effects: The Stock Market vs. 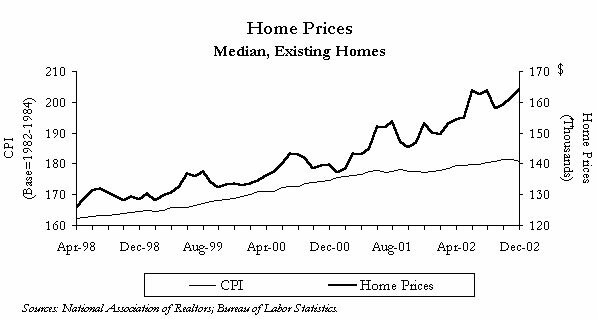 The Housing Market," working paper #8606, National Bureau of Economic Research, November 2001. 37 Frank Nothaft, Amy Crews Cutts; "Economic Uncertainty Persists," Economic & Housing Outlook, Freddie Mac, December 9, 2002: (http://www.freddiemac.com/news/finance/outlooks2002/outlook_120902. html). 38 Chairman Greenspan noted that there is a relatively low turnover rate of single-family homes due to substantial and emotional costs to homeowners of selling, buying, and moving. Therefore, "speculative conflagration" is very unlikely to occur. 39 Freddie Mac chief economist Frank Nothaft, as quoted by Betsy Schiffan, "Properties of War (Military Battle with Iraq Could Threaten U.S. Housing Market)"; Forbes.com special to ABCNEWS.com, November 1, 2002: (www.abcnews.go.com/sections/business/dailynews/forbes_iraz_021101.html). Automobile consumption accounts for only about 3.6 percent of the nation's real GDP. Still, automotive consumption is important because the movement of total durable goods consumption is highly correlated with the movement of auto sales since automobiles are a large component (40 percent of total durable goods) and are more volatile than non-auto durable goods consumption40 (see Figure 27). In addition, although durable goods consumption is the smallest component of total consumption, the volatility of total consumption is explained mostly by durable goods consumption, as seen in Figure 7, page 8 (the U.S. Economic Forecast section). Also durable goods consumption has become more important because the share of durable goods consumption has been increasing with the exception of the period from 1990 to 1994 (see Figure 28). In Q4 2001 consumer spending surged at 5.4 percent due to an auto boom in the same period. In early 2002, after the auto surge, the U.S. economy seemed to lack the pent-up demand that normally creates a spending expansion and drives economic recovery. Auto consumption spending was generally up in 2002 compared to 2001. The exception was October and November, which were down mainly because of the high base levels in 2001 (see Figure 29). For the full year, auto sales were up 5.6 percent in 2002, reaching their highest level in history. Though dollar expenditures have been rising for many years, this is not true for unit sales (see Figure 30). Despite the auto boom in 2001, auto unit sales have declined for two straight years. Therefore, it is not the case that consumers all have new cars now due to high auto unit sales in 2001 and 2002 and that there is consequently no more room for auto sales growth. Thus, consumers are purchasing more expensive autos rather than more vehicles. Part of this may be due to an increased ability on the part of consumers to make larger vehicle purchases due to low-interest rates, more leasing flexibility, and incentives. 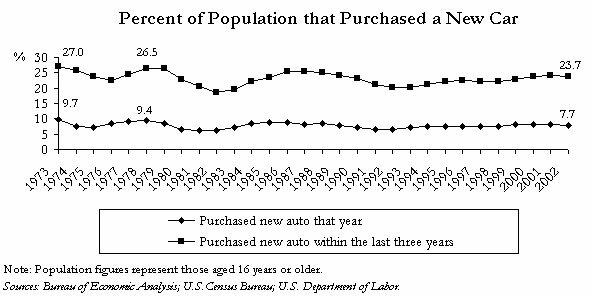 Compared to historic levels, the percentage of people owning a new or recently purchased auto is not high. In fact, in 1973, 27 percent of people over age 16 had a car less than three years old compared to just over 24 percent today (see Figure 31). With respect to employment, although Erie County has a high (but declining) concentration in the transportation equipment manufacturing industry (which includes automobile manufacturing), New York as a whole has a lower reliance on transportation equipment manufacturing than the nation (see Table 8).41 In Erie and Onondaga Counties, employment in the transport equipment industry fell from 16,900 in 1980 to 11,300 in 2000, a fall of 32.9 percent. 41 Erie County had the largest employment in the transport equipment industry among counties in New York State in 2000. Most of the demand for goods and services in the economy comes from the consumption sector. Therefore, the actions of consumers are key to the economy. Historically, the consumer has contributed to the cyclical nature of economic activity. As the economy started to decline, falling consumer confidence would lead to reduced spending, further hurting the economy. As economic downturns progressed, unemployment, which generally lags other indicators of economic activity, rose, further limiting the ability of consumers to spend and helping to prolong the economic decline. If the last recession can be taken as an indicator of how the structure of our economy has changed, the consumer may be a buffer against future economic cycles rather than a contributing factor to the recessionary spiral. In the recession that began in 2001, consumption remained strong despite falling employment and weakness in other areas of the economy. Part of this strength can be attributed to low mortgage rates resulting in solid growth in the housing market and extra household cash flow from heavy refinancing activity. Yet as long as the Federal Reserve adjusts rates to counteract recessions, this should not be considered just coincidence.42 Rates generally should be low during economic downturns, leading to strength in housing and refinancing activity. This effect may have been more pronounced in the most recent recession due to unprecedented access by the average household to equity credit markets. This same access may have also been responsible for strong auto sales and general consumption. In short, consumption may have changed to be much less governed by temporary economic cycles. Consumption has become more stable (less volatile) in recent decades. This can be seen in Figure 32, which shows the variance of consumption in different periods.43 Disposable income remains just as volatile now as it was many decades ago, and far more volatile than consumption. In other words, although what consumers earn varies a great deal over time, what they spend has become much more stable. According to the Permanent Income Hypothesis,46 consumers generally prefer to stabilize consumption across their life span. This tendency would apply to consumers in the 1940s or 1960s as well as today. What has changed is the ability of consumers to act on this desire to stabilize consumption. When comparing the 1940s to today, part of this change may have been through the expansion of social programs such as social security, unemployment insurance, and medical assistance programs that decouple spending from earned income and therefore tend to stabilize disposable income which includes these transfers. Part of the change may also be due to the growth in other sources of income outside of wages. A large source of the change however, particularly in more recent times, has been a revolution in the nature of consumer credit. Consumer credit has changed dramatically in recent years. Only twenty to thirty years ago, consumer credit was primarily a one-time source of financing for large fixed assets, particularly homes and cars. In recent years however, this has changed. Credit cards have become a dominant method of conducting transactions, as well as an important source of flexible financing for those transactions. Credit card debt has grown dramatically from the 1970s, when credit cards were an economically insignificant source of debt (see Figure 34). This is true not only in absolute terms, but also relative to the spending level of consumers. In just the last twenty years, credit card debt has tripled as a percent of consumption. Mortgage debt has also grown rapidly, doubling since 1960 as a percent of consumption. Rapid advances in information technology are partially responsible for these changes. These changes have been supplemented with statistical advances in credit scoring techniques that have greatly increased the accessibility of credit to the average consumer. Financial markets have also evolved to improve credit availability. This has happened on the consumer end, where credit issuers have become more sophisticated and competitive, and on the back-end financing, where markets for securitized assets have grown rapidly, becoming an important source of funding for credit issuers. Rising debt is not currently a major threat to consumer solvency. Due to falling interest rates, and more relaxed minimum payment requirements, the amount of debt payments as a percentage of disposable personal income (or debt service burden) has been fairly stable (see Figure 35).48 However, if interest rates rise significantly and consumers do not reduce their debt level to compensate, consumer solvency will be at risk. It certainly is not impossible for consumption to decline, but it may require a much more dramatic shock to lead to negative consumption growth today than a few decades ago. Consumption has typically dropped less than GDP, but in the last ten years consumption has never gone down, and consumption did not decline in the most recent recession despite three quarters of negative GDP growth. In fact, the only time since 1969 that consumption dropped more than GDP was during the 1980 recession where GDP dropped 2.2 percent peak to trough while consumption dropped 2.4 percent peak to trough.53 On average, the percentage drop in consumption has been only 52 percent of the percentage drop in GDP (see Figure 37). We may have entered an economic era in which consumption growth remains positive even during mild recessions. However the downside of this is that consumption is unlikely to grow as rapidly as income when income growth is strong. The forecast in this report for stable growth in consumption (slightly lower growth in 2003 than in 2002) is consistent with the trend discussed here; consumption has been largely unaffected by the current recession and is not expected to accelerate during this recovery. 42 Long-term, it is likely that the Federal Reserve will continue to move rates in a countercyclical fashion. It should be noted however, that in the current situation there is little room left for the Federal Reserve to decrease short-term rates further. 43 The variance can be interpreted as a measure of how much a data series varies from its average; a higher variance indicates the data is more volatile. 44 It should be noted that the correlation coefficient found in the period from 1993 to 2002 was not significantly different from zero and is probably best interpreted as implying no evidence of any significant relationship using recent data. This should not be taken to imply that income is not currently related to spending at all. In the long-term, spending must be constrained by income. However, the data suggests that though this may be true in the long-term, it does not hold for short-term data at the quarterly level. It is also important to note that the simple statistic shown here does not fully specify the consumption equation. Most notably, it does not take wealth into account in addition to income. Though wealth can account for some of the changes in consumption not explained by income, the general trend remains true even when wealth is included: the relationship between income and consumption changes has grown much weaker in recent times. 45The dates chosen are selected to roughly correspond to various eras in the consumer credit market. The 1960s and 1970s represent the early years of the credit card market, while in the 1980s to the early 1990s, consumer liquidity and credit card debt growth accelerated. The last period represents the modern era of high liquidity available to consumers across income levels and the revolution of information technology in credit marketing risk analysis and operations. Ultimately, the results here are not sensitive to the period chosen; the trend is robust to changes in the periods. The period before 1960 may also have been more volatile due to Regulation Q, which put a ceiling on bank rates, at times constraining the ability of banks to attract deposits, which limited the ability of banks to make loans. Although Regulation Q was still in effect after 1960, several increases in ceilings starting in 1957 and continuing throughout the 1960s made this rule a less significant constraint. 46 Milton Friedman, A Theory of the Consumption Function, (Princeton University Press 1957). 47 The Congress of the United States, Congressional Budget Office, The Budget and Economic Outlook: Fiscal Years 2004-2013, January 2003, Chapter 2 (Box 2-2), 12-13. 48 Debt payments consist of the estimated required payments on outstanding mortgage and consumer debt, Federal Reserve Board, Household Debt-Service Burden, September 18, 2002: (http://www.federalreserve. gov/releases/housedebt). Consumer debt includes the debt incurred by consumers rather than by corporations or government. It primarily consists of mortgages, credit card debt, auto loans, and other installment credit. 49 Peter S. Yoo, "Charging Up a Mountain of Debt: Accounting for the Growth of Credit Card Debt," Federal Reserve Bank of St. Louis Review, March/April 1997: 3-13. 50 Edward J. Bird, Paul A. Hagstrom, and Robert Wild, "Credit Cards and the Poor," discussion paper #1148-97, Institute for Research on Poverty, October 1997. 51 Although the Federal Reserve Board's Survey of Consumer Finances 1998 data shown here may give an accurate picture of the distribution of debt, it probably underreports the total debt level. The actual level of credit card debt may be as high as three times the self-reported level, see David Laibson, Andrea Repetto, and Jeremy Tobacman, "A Debt Puzzle," working paper #7879, National Bureau of Economic Research, September 2000. 52 This is particularly true of the time period shown in Figure 36, which includes the most recent data available from the Survey of Consumer Finances, Federal Reserve Board, 1998. However, recent trends in the stock market have partially reversed the gains in financial wealth. 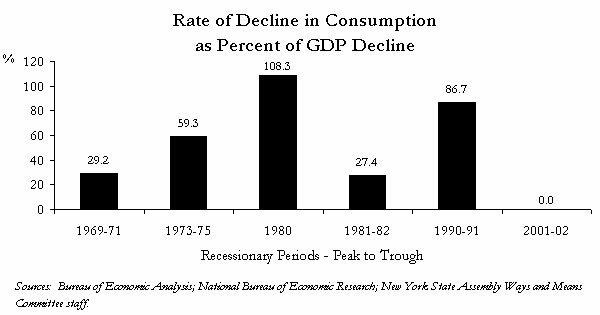 53 This 1980 consumption decline happens to coincide with consumer credit controls implemented by President Carter. Although the controls were "without teeth," the symbolic effect was large and resulted in many Americans using less credit. This was likely the cause of the unusually large decline in consumption in 1980. Stacey L. Schreff, "Credit Controls: 1980," Economic Review, Federal Reserve Bank of Richmond, November/December 1990, p. 25-50. 54 Within Q3 1980 and Q4 1991, the correlation coefficient between consumption and consumer confidence growth on a quarterly basis was 0.50 while it has actually been negative .02 from 1992 onward. The periods chosen are based on structural breaks found using Chow's breakpoint test. The test indicated two breakpoints, one at Q3 1980 and the second in Q1 1992 (p-values of less than negative .01 in both cases). This can also be seen from a close examination of the chart as discussed in the text for the two variables. This change remains the same using consumer sentiment and consumer expectations as well. Interestingly, the relationship between consumer confidence and GDP has not gone down, mainly because the relationship between consumer confidence and investment went up in the later period. Investment is expected to rebound in 2003. This will be led by growth in spending on capital equipment, which makes up most of investment and which in turn is dominated by information-processing equipment. Inventories are also expected to help investment to rebound since a build-up is due in this area. Corporate profits, which generally lead investment, have already started to turn around and are expected to continue improving. In 2001, investment posted a double-digit decline. This was the only double-digit decline since 1982 and only the fourth double-digit decline since 1950. However, looking a little further back, there were seven much larger declines in the 1930s and 1940s (see Figure 39). This suggests that although investment spending remains one of the more volatile components of GDP, it is much less volatile than it had been before the 1950s. The recent decline in investment has been driven by over-investment and excess capacity leading into the recession. The decline in the stock market has also been a factor in preventing a bounce-back by raising the cost of capital for firms. The components of investment include equipment and software, residential investment, non-residential structures, and change in inventories. Business capital equipment has been the largest component of investment for quite some time. Over the last forty years, this component has grown dramatically in share (see Figure 40). Residential investment is a distant second, making up 29 percent of total investment, down from a third of the total in 1960. Recent trends in non-defense capital goods factory orders, a leading indicator of business capital equipment investment, suggests that equipment investment may decline further (see Figure 41). The growth in the share of equipment and software in investment spending has been primarily due to rapidly rising investment in information processing, particularly since the 1990s. This can be seen when capital equipment and software spending is broken down (see Figure 42). Despite a fall-off in information-processing spending in 2001, spending has rebounded and is likely to continue rising long-term, though most likely not at the rapid rate it did during the 1990s. Information-processing equipment and software has been dropping in quality adjusted price55 by three to four percent annually in the last two years. This is primarily due to a drop in the quality-adjusted price of computer and peripheral equipment which dropped 18 percent last year and makes up 18 percent of total information-processing equipment and software spending. Software, which makes up close to half of the category (45 percent), actually experienced quality-adjusted price growth. It should be noted that much of the decline in computer and peripheral equipment quality-adjusted price took the form of quality changes rather than actual price declines for a current state-of-the-art system.56 Recently, information-processing equipment and software spending has been strong. 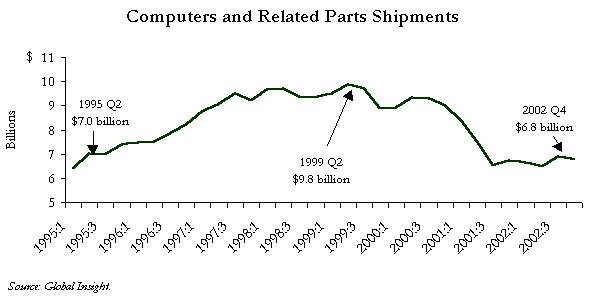 In Q4 2002, real software spending was up 5.4 percent year-over-year, while real spending on computers and peripheral equipment was up 24.6 percent. Despite holding only a three to four percent share in total investment, inventory levels tend to be more volatile and cyclical than some other components of investment and are therefore closely scrutinized by economists. Inventories appear to have bottomed out and should begin to grow again (see Figure 43). Inventories are held in large part so that firms will have a sufficient buffer to keep up with current sales. Therefore, inventory levels should be closely linked to the level of sales. Economists often use the inventory/sales ratio to track inventory levels. The inventory/sales ratio has experienced a long-term downward trend, caused in part by information technology that has enabled companies to more efficiently produce and distribute goods when they are needed rather than holding large buffers of materials, work in progress, and finished goods.57 Despite this downward long-term trend, the inventory/sales ratio experienced a short-term peak in 2001, suggesting over-investment in inventory (see Figure 44). This was followed by a rapid decline. Currently this ratio is below the long-term trend and therefore is likely to rise. Although investment is expected to improve in this forecast, uncertainty has been and may continue to be a drag on investment. War uncertainty in particular may be more of a drag on investment than war itself. If the question of war continues to linger rather than quickly resolve itself, this could be a drain on investment spending. 55 Quality-adjusted prices are calculated by the Bureau of Economic Analysis for certain categories of spending, such as information-processing equipment. The quality-adjusted price uses a statistical model to take into account changes in the quality of a good. For example, as computers get more powerful, looking just at the current selling price of a "typical" computer does not take into account the change in the nature of the product. The quality-adjustment process takes into account how much consumers normally would be willing to pay in the market place for a faster processor and more memory, for example. The prices of the computers are then adjusted for these changes in processor size and memory (among other things). This has the effect of making the price drop in computers steeper than it would be before adjusting for quality. 56 Although actual price declines tend to dampen spending growth, the changes in quality can more than make up for this by causing earlier replacement of equipment. Historically, the rising unit sales of computer equipment have more than made up for any drop in actual cost, causing computer and peripheral equipment spending to grow an average of seven percent per year during the last decade. 57 In 2001 and 2002, issues related to transportation networks including port closures, airline issues, and security checkpoints at borders and bridges may at times have had a material impact on inventory accumulation. This factor would have acted to increase inventories or at least dampen recent declines. The relatively low U.S. productivity growth rate in the 1970s through the mid-1990s is attributed to various reasons: the oil shock of 1973; a slowdown in the rate of production of new knowledge; declining skills in the work force; the shift to service production; a fall in the rate of investment; and so on. The revival of productivity growth in the late 1990s is attributed to information technology. More specifically, it is attributed to the falling price of computer hardware, the effect of increase in skills in the workforce in general, and the general-purpose nature of the new technologies. The power of the new technologies that are employed is derived from two important features. First, these technologies involve much more social interaction and greater use of inputs that are shared across users.59 These features of the new technologies of production imply that costs tend to fall as the scale of production is increased, and the expansion of production over time tends to be self-propelling. The capacity of the economy to grow over time, therefore, is greatly enhanced by new technologies. Second, these technologies are "general-purpose technologies" which can be applied to most industries, and they encourage complementary innovations. The deepening of information technology capital is possible in all economic sectors, and this implies that the beneficial effects of the fall in the price of capital goods, such as computer hardware, is more generalized. Skeptics argue that the power of these new technologies is vastly exaggerated.60 One study estimates that 88 percent of the economy outside the durable manufacturing sector has been unaffected by the productivity improvements due to information technology.61 This study argues that the capacity of improvements in chip speed, word-processing, spreadsheets, and the Internet to produce deep and lasting improvements in aggregate productivity is limited. The calculations in this study suggest that cyclical factors account for a significant part of the productivity growth increase, and that the effect of the increase in information technology capital on aggregate productivity increase is small. Other studies question the validity of these calculations. While the effect of the increase in global competition on the U.S. economy is not as widely examined as the effect of information technology use, increased competitive pressure is reported by many sources. The manufacturing industries of New York, for example, have felt the effects of the loss of international demand. There are differing interpretations of the implications of the new technologies of production for macroeconomic relationships. Some economists argue that many of the basic macroeconomic relationships have undergone fundamental changes due to increased economic interdependence among workers and industries and the tendency for costs to fall with the scale of production. Most economists maintain, however, that conventional macroeconomic theory can interpret these changes fairly well. In the latter view, technological changes in the economy lead to predictable effects that can be understood with conventional macroeconomic theory.65 The increase in the availability of real-time information on production and inventories, for example, is crucial in the formulation of business decisions and has contributed significantly to the shortening of the business cycle, particularly during a recession. The increase in the availability of information in the labor market has reduced job search costs, which has reduced friction in the labor market, which in turn has made it more easy to maintain conditions of full employment. The tendency for costs to fall and the reduction of friction in markets makes it possible to sustain economic expansion at lower inflation and lower rates of unemployment than was possible before. The producers and the users of information technology experienced the strongest growth in productivity in the late 1990s.66 Further, productivity growth accelerated in most economic sectors. While information technology-producing industries experienced the largest productivity growth and productivity acceleration in this period, information technology-using industries experienced higher productivity growth and acceleration than industries that do not use information technology intensively. Figure 46 shows that the growth in one aspect of important information technology in New York State was strong. Between 1995 and 2000, the number of computer programming jobs in the State doubled. While much recent research stresses the role of information technology in the observed increase in productivity growth, many other factors contributed to this revival.72 For example, there is significant increase in the growth of productivity outside the information technology hardware sector that is unrelated to information technology. Innovative business practices have also made a significant contribution to productivity growth. It may also be true that part of the information technology expansion was caused by general economic growth. 58 The principal arguments of the Productivity section are based on Martin N. Baily, "The 'New Economy': Post Mortem or Second Wind" Journal of Economic Perspectives 16(2), spring 2002, 3-22; J. Bradford DeLong and Lawrence H. Summers, "The 'New Economy': Background, Historical Perspective, Questions and Speculations," Economic Policy for the Information Economy, Federal Reserve Bank of Kansas City, 2001; and Kevin J. Stiroh, "New and Old Economics in the 'New Economy'," Federal Reserve Bank of New York, 2001. See also New York State Assembly Ways and Means Committee, Economic Report, February 2001. 59 Paul Romer, "Increasing Returns and Long-Run Growth," Journal of Political Economy 94, 1986, 1002-37; Robert E. Lucas, "On the Mechanics of Economic Development," Journal of Monetary Economics 22, 1988, 3-42; J. Bradford DeLong and Lawrence H. Summers, "The 'New Economy': Background, Historical Perspective, Questions and Speculations," 2001; Economic Policy for the Information Economy, a symposium sponsored by the Federal Reserve Bank of Kansas City, August 31, 2001. 60 Robert J. Gordon, "Does the 'New Economy' Measure Up to the Great Inventions of the Past," working paper #7833, National Bureau of Economic Research, August 2000. 62 In a survey of 30 forecasters conducted by the National Association for Business Economics, 90 percent reported their belief that the evidence of higher long-term productivity growth is convincing. 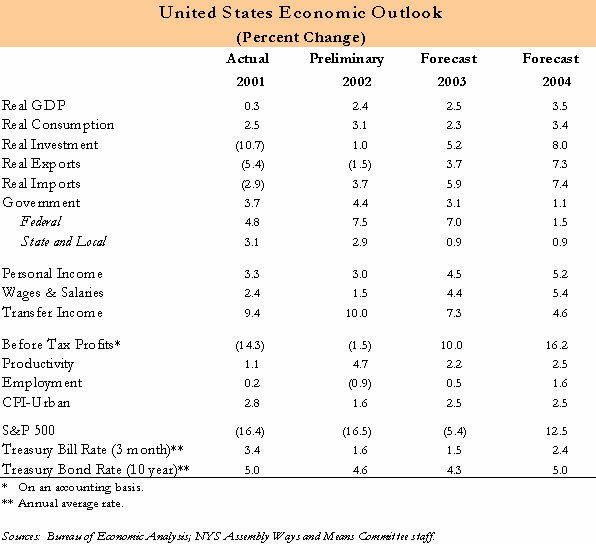 See the "National Association for Business Economics Outlook," May 2002: (http://www.nabe.com). 63 Martin N. Baily, "The 'New Economy': Post Mortem or Second Wind?" 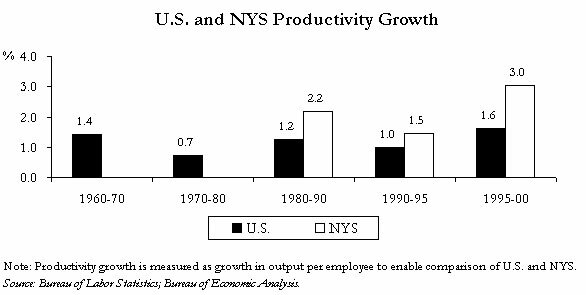 Journal of Economic Perspectives 16(2), spring 2002: 3-22; Rich Miller, Peter Coy, Rob Hof, et al., "Productivity's Second Wind," BusinessWeek Online, February 17, 2003. 64 "Economic Statistics for Greater Rochester," Greater Rochester Metro Chamber of Commerce, 1999. 65 Kevin J. Stiroh, "Investing in Information Technology: Productivity Payoffs for U.S. Industries," Current Issues in Economics and Finance 7(6), June 2001. 67 Kevin M. Murphy, Craig Riddell, and Paul M. Romer, "Wages, Skills, and Technology in the United States and Canada," working paper #6638, National Bureau of Economic Research, July 1998. 68 Alan B. Krueger, "How Computers Have Changed the Wage Structure: Evidence from the Microdata, 1984-1989," Quarterly Journal of Economics 108(1), 1993: 33-60. 69 Specifically, increased demand for high-skill, non-trade industries, such as FIRE, business services, and legal services. 70 David H. Autor, Frank Levy, and Richard J. Murnane, "The Skill Content of Recent Technological Change: An Empirical Exploration," NBER Working Paper No. 8337, June 2001; David Card and John E. DiNardo, "Skill Biased Technological Change and Rising Wage Inequality, Some Problems and Puzzles," NBER Working Paper No. 8769, February 2002; James Harrigan and Rita A. Balaban, "U.S. Wages in General Equilibrium: The Effects of Prices, Technology, and Factor Supplies, 1963-1991" NBER Working Paper No. 6981, February 1999; Steven G. Allen, "Technology and Wage Structure," NBER Working Paper No. 5534, April 1996; Keith Sill, "Widening the Wge Gap: The Skill Premium and Technology," Business Review, Federal Reserve Bank of Philadelphia, 2000 Q4, 25-32. 71 Rich Miller, Peter Coy, Rob Hof, et al., "Productivity's Second Wind," BusinessWeek Online, February 17, 2003. 72 Martin N. Baily, "The 'New Economy': Post Mortem or Second Wind," Journal of Economic Perspectives 16(2), spring 2002: 3-22. The high-tech and Internet boom of the late 1990s was fueled by over-investment in equipment and telecommunication capacity. When boom went to bust, the fallout in the various high-tech sectors looked much different. Many telecommunication companies with mountains of debt and capacity far in excess of demand lacked sufficient revenues to pay their debt service and stay in operation. The majority of dot-com failures came from an inability to create or redefine existing markets, which led to poor revenues and a lack of cash to continue operations. Computer equipment makers saw their sales plummet as corporate spending on technology failed to continue at the same strong pace that it had in the run up to Y2K. Weak computer sales and businesses unwilling to invest in new software because of their own poor outlook left revenues in the basement for software makers. Two of the biggest times for home computer sales are in late summer, just before school resumes, and the December holidays. In about an eight-week period, back-to-school sales account for one in five computers sold. Normally, demand increases roughly 50 percent, but in 2002 demand rose only 35 percent.73 Holiday sales also appear to have been significantly lower in 2002 than in 2001, based on preliminary census data.74 In general, consumers seem unwilling to spend money on new computers that do not offer significant improvements during an economic slow-down. According to International Data Corporation, a market research firm that tracks PC sales, 2002 growth in PC shipments is estimated at just over one percent. Growth should increase in 2003 to approximately eight percent. Growth in PC sales has been due to growth in sales of notebook computers. While the price of desktop units has dropped, sales have also trailed off partly due to upgrades and a decline in the growth of first time buyers. 73 "Students Take Old PC's Back to School," Reuters News, September 6, 2002. 74 U.S. Census Bureau, "Unadjusted and Adjusted Estimates of Monthly Retail and Food Services Sales by Kinds of Business," 2002: (http://www.census.gov/mrts/www/data/html/nsal02.html). 75 "IDC Sees Solid PC Market in Second Half of 2002 and Projects Growth of More than Eight Percent in 2003," IDC Press Release, December 6, 2002: (http://www.idc.com//getdoc). 76 John Markoff, "Researcher Cuts Sales Forecast for Computers through 2003," The New York Times, September 9, 2002. Like the railroad lines of the nineteenth century, telecommunications capacity has recently expanded at a faster rate than demand for service. More than 500,000 jobs were eliminated. As much as $440 billion in investment has been lost.77 Still, all the over-investment has led to cheap communication prices and may have laid the groundwork for robust economic growth in the years to come. The convergence of the Telecommunication Reform Act of 1996 and technological advances resulted in financial markets pumping large amounts of capital into telecommunication investments. It is estimated that local and long-distance phone companies spent $319 billion from 1997 to 2001 building their networks. Mobile telephone companies spent some $58 billion. Most of this spending benefited the companies that made microchips, software, fiber-optic wires, and network equipment. With so much capacity being added and demand not growing fast enough, prices have dropped. This situation got worse when advances in wavelength division multiplexing (WDM) technology exponentially expanded capacity. With WDM, a single fiber optic line can carry multiple signals at once. In just over three years, transmission capacity across the North Atlantic increased nineteen-fold while the cost of a leased line dropped to $10,000 per year from $125,000. J.P. Morgan and others made a fortune making profitable businesses out of bankrupt railroad's assets. Today, investment firms such as Berkshire Hathaway, Legg Mason, and Pacific Management Investment Co. are buying up the bonds of money-losing telecommunication firms in hopes of creating profitable companies from their fiber optic assets. However, Reed Hunt, former Federal Communication chairman, warns, "it could easily be into the 2010s and not the zeroes when we need more [capacity]. "78 Thus, the prospect of expanding telecommunication networks fueling demand for microchips, software, fiber-optic lines, or network equipment companies is unlikely. 79 Mark Veverka, "Plugged In: Now the Powell (Telecom) Doctrine," Barron's, Technology Week, p. T3, January 2003. 80 Jeffrey A. Eisenbach and Thomas M. Lenard, "Telecom Deregulation and the Economy: The impact of 'UNE-P' on jobs, investment, and growth," Progress on Point, The Progress and Freedom Foundation. 81 Jessica Hall, "FCC Ruling Unlikely to Boost Baby Bell Spending," Reuters News, February 21, 2003; and Andy Sullivan, "FCC Keeps Phone Competition, Loosens Broadband," Reuters News February 20, 2003. The stock market is tied to both the national and New York State economy. Mainly the "wealth effect" and "Q theory" can explain the linkage of stock prices to national consumer spending and business investment.82 Besides being affected through these same channels, the State economy also has additional direct effects through State wages and salaries. New York has a high concentration of securities industries wages and salary which in turn is strongly related to financial market performance. 82 Q is the ratio of the market value of financial liabilities to the replacement value of physical assets. When the market value of capital exceeds its replacement cost due to stock price appreciation, the desired level of capital stock by business rises. The stock market decline since 2000 has several causes. Recently, one cause has been weak investor confidence due to accounting scandals and corporate misbehavior. Shaky economic recovery, low corporate earnings, and the uncertainty created by the war on terrorism have also contributed to the stock market decline (see Figure 49).86 Based on the price-earnings ratio, it could also be argued that overvalued stocks are the primary cause of the decline, but whether stocks are currently overvalued is still open to debate (see footnote 25 on page 33 for further discussion). 83 This is based on looking at the change in price from the start of the year to the end of the year. Elsewhere, where the forecast is discussed, estimates are based on yearly average price. 84 "Markets Down Third Year in Row," Financial Times, December 31, 2002, p. 1. 85 These declines are based on 2002 average prices from January 2 to December 31 compared to the same period in 2001. 86 Based on the price-earnings ratio, it could also be argued that overvalued stocks are the primary cause of the decline, but whether stocks are overvalued is still open to debate (see Footnote 25 for further discussion). U.S. bond issuance was propelled by low interest rates, slow economic growth, and federal budget deficits. Domestic bond issuance totaled a record $5.4 trillion in 2002, an increase of 18.4 percent over 2001. Across all sectors, only corporate bond issuance decreased to $594.4 billion, down 26.3 percent from $806.9 billion in 2001. Municipal issuance reached a record $430.7 billion, up 25.6 percent compared to 2001. Different types of bond market debt are shown in Figure 50. Corporate and municipal bonds affect securities industry profits directly through underwriting and trading activity and indirectly through a few other channels. Other bonds also affect industry profits not through underwriting but through secondary market trading. The Securities Industry Association (SIA) estimate for industry profits in 2002 is $4.8 billion as of January 2003.87 The estimation suggests that the 2002 profits will be the lowest in eight years, and industry recovery will be further delayed primarily due to weak equity markets and slow economic growth (see Figure 51). More specifically, investment banking activities such as IPO underwriting and merger and acquisitions are holding back the securities industry's profits. The 2002 drop in profits is the second consecutive annual decline. In 2001, securities industry profits dropped $10.6 billion, the largest dollar decline ever. In 2003, securities industry profits are expected to be $7.5 billion. Although this is low compared to the $21 billion peak reached in 2000, it is an improvement from 2002 and the eighth best year in history. Sources of revenue for the securities industry have been affected not only by falling stock prices, but also by general economic uncertainty. This has caused many of the industry's clients to take a "wait and see" attitude. This can be seen in low trading activity recently. Firms considering going public or considering mergers have also been opting to wait rather than act now. The Ways and Means Committee staff forecasts 2003 profits will be $7.5 billion. This forecast is based on the average of the range in the most recent forecast from SIA released December 29, 2002. An adjustment was then made for estimated litigation and settlement costs of $1.1 billion. 87 This estimate includes the impact of the securities industry settlement reached in December 2002. For more information on this settlement, see the Corporate Governance section on page 82 of this report. Several of the affected companies included these write-offs into their fourth quarter financial statements as an operating expense. Estimated pre-tax profit in 2002 before research settlement charges and anticipated litigation cost write-offs is $7.0 billion. After including $2.2 billion as the cost of the settlement and potential future litigation as an operating expense in the fourth quarter, securities industry annual profit is $4.8 billion. The Securities Industry Association predicted that there is still at least a $1.1 billion overhang in potential 2003 write-offs for the settlement and estimated future litigation costs. This additional amount is included in the 2003 forecast. The NYSE's year-to-date daily average share volume increased 16.2 percent to 1.4 billion, while the NASDAQ decreased 7.9 percent to 1.7 billion in 2002 compared to 2001. At $40.9 billion, average daily dollar value traded in NYSE is down 3.3 percent, compared to 2001 (see Figure 52). Due to decreased stock price, NASDAQ's year-to-date average dollar volume dropped 34.7 percent to $28.8 billion from $44.1 billion over 2001 (see Figure 53). Secondary bond market trading volume increased across all sectors, with the exception of the federal agency market. Daily trading volumes of each type of bonds are provided in Table 9. Long-term trading volume for the three most-heavily traded types of bonds has been rising except for federal agency debt in 2002, which declined (see Figure 54). Total corporate debt underwriting volume reached $2.4 trillion, a 2.6 percent increase over last year. However, underwriting for straight corporate debt88 declined 13.8 percent. 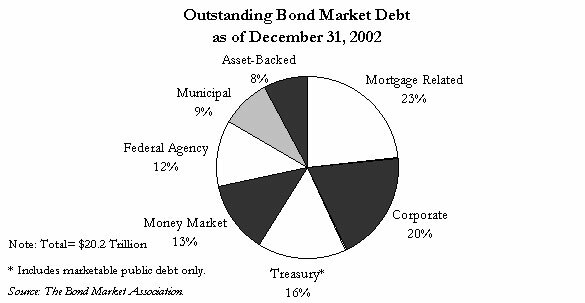 Equity underwriting dollar volume in 2002 was lower at $154.0 billion compared to $169.7 billion a year ago (see Figure 55).89 Municipal bond underwriting volume totaled $355.4 billion, up 25.3 percent from 2001. During 2002, overall volume of stock and corporate bond underwriting in the U.S. market totaled nearly $2.6 trillion, 1.8 percent above the amount raised in 2001. IPO underwriting volume was $25.8 billion, down 28.4 percent from 2001. The annual underwriting volume in 2002 for IPO's was the lowest in ten years. 88 "Straight corporate debt" excludes asset-backed and convertible bond debt. 89 Including common and preferred stock, and high-yield bonds. In comparison to 2001, the merger and acquisition (M&A) activity in 2002 remains depressed. The number of deals slid 11 percent to 6,833 deals in 2002 compared to 7,676 deals in 2001. Announced dollar volume for 2002 is $457.8 billion, the lowest level since 1994. This is down 45 percent from $826 billion in 2001 and down 74 percent from a record $1,741 billion in 2000. Factors contributing to the decline in M&A activity include declining stock price and uncertainty about future corporate earnings. The lack of visibility of earnings makes it difficult to determine a proper takeover valuation. As the market price of the seller declines, it becomes harder for the acquirer to justify paying a large premium. The slow economic recovery may have prompted many companies to focus on their own business to improve their earnings, rather than expanding through M&A. In addition, accounting issues may play a role in reducing M&A activity by causing potential buyers to be more cautious about reported financial results. Securities industry variable compensation is linked with securities industry profits (see Figure 56). When industry profits decline as they did in 1990, 1994, and 1998, variable compensation tends to be weak but "sticky" downward. In other words, the decline in variable compensation is generally less severe than the decline in profits. Securities industry variable compensation made up almost half of total variable compensation in New York State in 2001. Variable compensation in the New York State securities industry is expected to go down 36.1 percent during the State Fiscal Year (SFY) 2002-03 for its second annual decline compared to a 53.8 percent decline in securities industries profits in 2002. Securities industry variable compensation is expected to go up 14.3 percent during SFY 2003-04. Variable compensation in all other sectors is expected to go down 19.8 percent in SFY 2002-03 and up 6.7 percent in SFY 2003-04. The smaller decline for all other sectors is due to lower historical volatility in variable compensation for these sectors. It should be noted that uncertainty regarding how much variable compensation will be and how much of this compensation will come in the form of stock options versus cash payments are major risk factors to the Ways and Means Committee staff forecast of New York State wages. The dollar was flat compared to a basket of trade-weighted currencies in 2002. Using the Federal Reserve's real broad index of foreign exchange rates, the dollar was up 0.3 percent in 2002. Exchange rates are driven in large part by investment prospects relative to those of other countries. Therefore, part of the weakness in the U.S. dollar in 2002 has been driven by concerns regarding corporate scandals that made United States investments less attractive. General economic uncertainty has also impacted the value of the dollar. 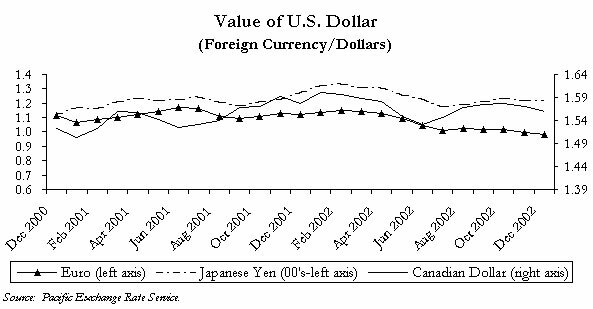 It should be noted that despite the decline of the dollar, its value is still stronger than it was at the start of 2001 versus both the yen and the Canadian dollar. Compared to the euro, the dollar is down compared to the start of 2001 (see Figure 57). A strong dollar also makes U.S. goods less attractive to foreigners and foreign goods more attractive to U.S. residents. It therefore causes a double hit to the country's balance of trade, or net exports. This has certainly been the case in the United States, which has faced a growing trade deficit (see Figure 58). This has been a drain on the economy for many years, currently reducing GDP by about five percent.91 In fact, the last year the U.S. had a positive trade balance was in 1981. In 2003, it is expected that war uncertainty combined with general economic uncertainty will make U.S. investments less attractive, further eroding the value of the dollar. One upside of a weak dollar to New York is that it may help New York's tourism industry since New York City gets a large number of foreigners visiting and a weak dollar makes travel to the United States more attractive. However, security and a weak world economy may more than counter this effect. It is likely that net exports will continue to become even more negative as we look forward. In general, the major economic powers around the world are not doing well. Despite weak U.S. growth, it is estimated that in 2002 the only large country in the Organization for Economic Cooperation and Development (OECD) to grow faster than the United States was Canada.92 However, an important question is whether there are any international situations that threaten to destabilize the trade situation. The most likely threats to trade appear to be the Middle East, South America, Japan, and Mexico. Currently these partners make up 3 percent, 5 percent, 8 percent, and 14 percent, respectively, of U.S. exports (see Figure 59). A war in the Middle East would quite likely impact our major trading partners and their relationship with the United States. In terms of the aggregate value of exports, this region represents a relatively minor threat. However, the importance of oil imported from the region to the United States and its potential impact on the economy is well known. Japan's economy has been stagnant for many years. The country recently had news of renewed economic difficulty as the country's stock market reached a twenty-year low and the unemployment rate reached its highest level since World War II. Since Japan is an important trade partner, these economic problems will have some impact on the United States. The threat in South America stems from economic turmoil in Brazil, Argentina, and Venezuela. Argentina's GDP plummeted 10.1 percent year-over-year during Q3 2002. Over that same period, consumer prices jumped 36.0 percent. Argentinean debt is currently perceived to be highly risky by the market, with a bond spread of 6,000 basis points (i.e., if U.S. rates were six percent the Argentinean debt would have a rate of 66 percent) over U.S. Treasury bonds.93 This is a dramatic jump from a spread of under 1,000 basis points in early 2001. Brazil is in somewhat better shape than Argentina, but still suffers from market concerns. This has led to a bond spread of 1,300 basis points for Brazil's bonds over U.S. Treasury bonds in Q1 2002. This implies serious concern that the country will default on its debt. There is also serious concern that the problems in Brazil and Argentina will spread to other countries. Uruguay has already been affected and other South American countries are also at risk. Mexico might well escape unscathed, but is of concern because it is such an important trade partner to the United States. It is second only to Canada in terms of the value of exports it purchases from the United States. However, New York State is less at risk from the Mexican economy than the rest of the United States. Mexico purchases 13.9 percent of the nation's exports, but only 6.2 percent of the exports produced in New York State (see Figure 60). 90 "World Markets," Securities Industry Briefing Book, ser. ed. Elizabeth L. Rives, Chapter 4, Securities Industry Association, 2001: (http://www.sia.com/publications/pdf). 91 Recent data from the U.S. Department of Commerce does suggest that the trade deficit may be less severe than it appears when looked at from a slightly different perspective. This would imply that the trade deficit might be a less serious cause for concern than many people assume. The import and export data typically used looks at where a good or service is produced to measure trade. However, if ownership is used as the basis for defining where a good originates (i.e. if goods produced by U.S. companies overseas and sold overseas are treated as exports), then the trade deficit drops by about 25 percent using 1999 data. See Jeffrey H. Lowe, "An Ownership-Based Framework of the U.S. Current Account, 1989-99," Survey of Current Business, Bureau of Economic Analysis, April 2002, 25-7. 92 U.S. Office of Management and Budget, Analytical Perspectives: Budget of the United States, Fiscal Year 2004, 2003, p. 24. 93 Bond spreads prepared by JP Morgan and reported by the United States Department of Commerce. The impact of these accounting issues has also not been limited to the firms in question. Their creditors, investment bankers, and accountants have also been impacted by the scandals. At Anderson, the auditor of Enron, misconduct has resulted in criminal charges. Citigroup's reputation has also been affected by its role in both the WorldCom and Enron scandals. In the case of WorldCom, there is some evidence that Citigroup may have made loans without adequately insuring that they would be repaid because of WorldCom's importance to Citigroup's investment banking business. J.P. Morgan is also alleged to have participated in some of Enron's financial arrangements while being aware that there was reason to be suspicious of the deals.96 Investment banking firms, facing a range of misconduct charges from the Securities and Exchange Commission and New York Attorney General Eliot Spitzer, reached a settlement in December 2002 that will require them to pay $1.4 billion, including a $700 million charge to profits in Q4 2002. The $1.4 billion settlement includes $900 million in fines, $450 million to establish independent research for investors, and $85 million for a national investor education program, with the total amount to be split between the ten largest brokerage firms in the nation (see Figure 62).97 The fines will be paid both to the federal government's Securities and Exchange Commission and to the states. Although the settlement amount runs in the billions, some critics believe it is too low. The settlement does not include several other major fines levied in 2002, including a $100 million penalty levied on Merrill Lynch in May 2002 for misleading research. Over all, banks, brokers, and lenders have paid close to $3 billion in regulatory fines and court settlements in 2002, a tenfold increase from 2001.98 But this total includes banks outside of the securities industry. Within the securities industry, in addition to the $1.4 billion settlement and other 2002 penalties, firms are setting aside large amounts of cash in anticipation of future litigation resulting from alleged misconduct. As previously discussed, these charges are estimated by the Securities Industry Association to total $2.2 billion in 2002 and at least another $1.1 billion in 2003. 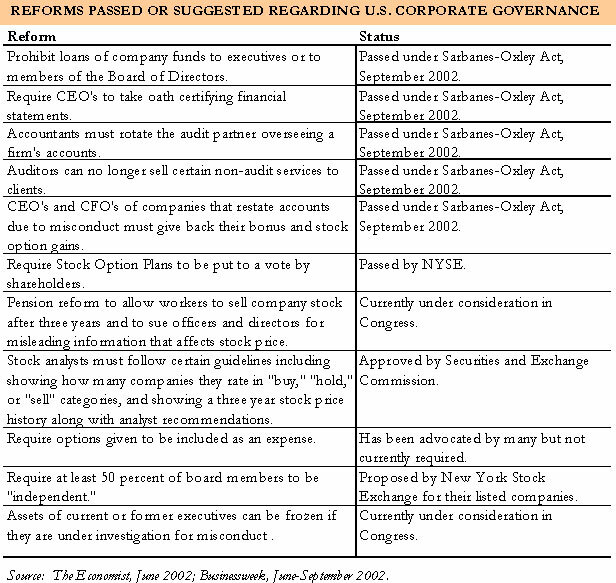 The scandals have resulted in several reforms that are intended to address the problem (see Table of Reforms below). These actions have been taken both by Congress and by the Stock Exchanges. However, critics say that these actions do not go far enough. Corporations can still treat stock options as if they are not an expense, even though they do dilute shareholder value. The executives rather than the shareholders can still control boards for all practical purposes. And partners such as investment banks still may have incentives to overlook problems at a corporation. A superficial look at the data may suggest that executives do have to earn their pay. Executive incentive-based pay, particularly stock options, has increased since 1995 while the share of pay given in salary has declined (see Figure 63). In reality this simple data does not give the full picture. In 2001, while profits declined 35 percent at a sample of 200 large companies, the median pay of those companies' executives actually increased 7 percent.102 The same could not be said for the average worker. It appears that executive pay may go up in bad times, and go up even more in good times. Part of this may be due to their power to influence the board to which they are supposed to report. For example, when many options became valueless during the recent stock market decline, some executives got their board to change the rules for their options so that they once again had value. This is legal for the boards to do, but it in effect takes away much of the incentive value of giving options in the first place. In the end, regulations can only solve part of the problem. From managerial discretion in deciding what defines a capital investment versus an expense, to discretion in valuing inventory, there are numerous legal accounting gimmicks that can be used to distort financial reports. Ultimately, financial markets must depend on some degree of trust that companies are performing the way they claim to be. This is precisely why the recent accounting scandals have been so damaging. This is particularly true for New York, where not only some of these companies, but also their bankers and the markets often reside. However, trust must be earned. A return to trust in corporate accounting board oversight of executives and the conduct of investment banking firms in turn depends on business conduct that does not result in scandals and executive pay that is in line with corporate performance. 94 Results are from a study of 23 firms under investigation, as reported on Lou Dobbs Moneyline, televised on CNN, September 2, 2002, Transcript # 090200CN.V19. 95 "Corporate Reform," Financial Times, December 30, 2002, p. 9. 96 Julie Creswell, "Banks on the Hot Seat," Fortune, September 2, 2002, pp. 79-82. 97 John W. Schoen "Wall Street Settles Conflict Claims," MSNBC News, December 20, 2002: (http:www.msnbc.com). 98 Ari Weinberg, "Wall Street Fine Tracker," Forbes.com, Financial Section, December 30, 2002: (http.www.forbes.com). 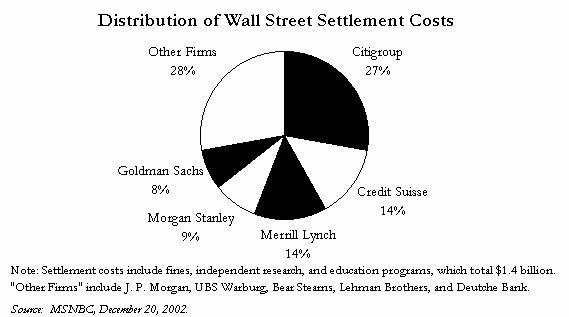 99 Adrian Michaels and Joshua Chaffin, "Wall Street to Come Under Further SEC Scrutiny," Financial Times, February 7, 2003, p. 1. 100 Victoria Thieberger, "Fed's McDonough Calls for CEO Pay Cuts," Reuters News, September 11, 2002. 101 Lucian Arye Bebchuk, Jesse M. Fried, David I. Walker, "Managerial Power and Rent Extraction in the Design of Executive Compensation," working paper #9068, National Bureau of Economic Research, July 2002. 102 David Leonhardt, "Executive Pay: A Special Report," The New York Times, April 7, 2002. The major concerns of monetary policy in 2002 were the fall in equity prices, the decline in investment spending, and the effects of September 11th.103 Further, the Federal Reserve officials have also expressed concern over the economic disturbance caused by questions concerning corporate governance, including accounting practices, and the effect of the weakening economy on the national budget. The Federal Reserve has indicated that they see some early signs of recovery, such as from the recovery of inventory investment. At the same time, there is recognition that the low interest rate policy followed through 2001 and 2002 may come under pressure in the future. The low level of inflation and the high level of productivity growth have allowed considerable flexibility for monetary policy so far. While the lower federal funds rate resulted in lower short-term interest rates, the level of the long-term Treasury rate rose through April 2002. The treasury yield spread-the difference between the ten-year Treasury bond and the three-month treasury bill-turned positive in 2001 and remained high in 2002 (see Figure 65). A positive yield spread may be an indication of an impending economic recovery,106 both of increasing real activity and higher inflation, but the recent increase in the yield curve could indicate the expectation of a recovery or the expectation of higher future budget deficits. Most monetary policy statements of the years 2001 and 2002 are also marked by a sense of uncertainty around the economic slowdown and recovery, which have been unusually shallow. While the improvements in information technology have improved the economic responses of the private sector-in the adjustment of inventories, for example-and contributed to the reduction in the severity of the recession, the shallowness of the recession may have increased the problems of synchronization of business activity during the recovery. These difficulties add to the uncertainty and the weakness in the recovery process. 103 Information on monetary policy was gathered from statements from the Federal Reserve web site: (http://www.federalreserve.gov/). 104 Macroeconomic Outlook Teleconference, Economy.Com, September 18, 2002. 105 Other options available to the Federal Reserve are discussed further in the Interest Rates section of this report. 106 Arturo Estrella and Frederic S. Mishkin, "The Yield Curve as a Predictor of U.S. Recessions," Current Issues in Economics and Finance, Federal Reserve Bank of New York, June 1996. 107 D. Wessel, "Putting a Price Tag on Victory in Iraq," The Wall Street Journal, October 24, 2002, p. A2. 108 The Congress of the United States, Congressional Budget Office, Estimated Costs of a Potential Conflict with Iraq, September 2002. Oil prices always have downside risk and upside potential to any economic forecast. Following a trail-off in the winter of 2000-01, the price of imported crude oil by U.S. refiners did not rise much during the summer of 2001. The price hovered around $23 per barrel through the beginning of September 2001. After the events of September 11th, demand for jet fuel, diesel, and gasoline fell. Despite production cutbacks by OPEC countries and Russian producers, oil prices did not climb back above $20 per barrel until March 2002. Partially out of fear of a war with Iraq, oil prices rose in the second half of 2002. In September 2002 oil prices, as measured by the U.S. 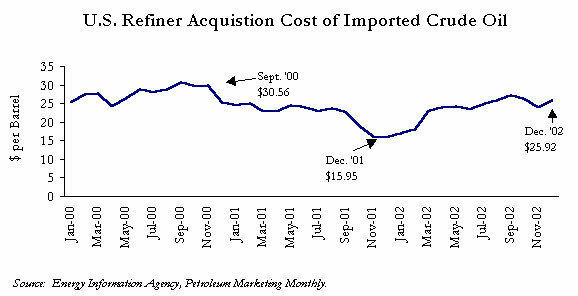 Refiner Acquisition Cost of Imported Crude Oil, reached about $27 per barrel and ended the year at $25.92 (see Figure 66). Much of the focus of oil news recently has been on supply concerns, regarding both the Venezuelan strike and the possibility of war in Iraq. While Venezuela is a major supplier of oil to the United States (the U.S. imports over ten percent of its crude oil supply from Venezuela), recent reports suggest that other countries, namely Saudi Arabia, have supplemented the disruption in Venezuelan exports.109 This has prevented additional price increases or shortages due to the Venezuelan strike. Should war occur, it would not be surprising to see the price of oil continue to rise. In early December 2002 the West Texas Intermediate (WTI) spot crude oil price was around $27 per barrel. The Venezuelan strike pushed it to over $30 by mid-December, and it has been above $30 since. Also, U.S. crude oil inventories have recently neared the Lower Operational Inventory level (270 million barrels), further exerting upward pressure on prices.110 Higher oil prices raise production costs for goods and services throughout the economy, as well as decrease purchasing power and consumer spending. 109 Energy Information Agency, "OPEC," January 8, 2003: (www.eia.doe.gov/emeu/cabs/opec.html). 110 "This Week in Petroleum," EIA.DOE.gov, February 12, 2003: (http://tonto.eia.doe.gov/oog/info/ twip/twip.asp). 111 Data from the NYS Department of Labor ES 202. 112 Data from NYC and Company, New York. Between the fourth quarters of 2000 and 2001, total office space in Manhattan was reduced by 13.4 million square feet; this reflects the effect of the attack of September 11th, the restoration of buildings with minor damage during Q4 2001, and the growth of new office space during the year due to construction. The amount of unoccupied office space increased 19 million square feet in the same period. Vacancy increased despite the fall in the total amount of office space, indicating weak demand. The combined effects of the national recession and the attack of September 11th on economic activity in Manhattan lowered the demand for Manhattan office space by 32.4 million square feet or 8.4 percent of total Manhattan office space. 113 Total office space data are from Cushman and Wakefield for Q3 2001; estimates of damage and destruction are from Tenantwise.com, July 2002: (http://www.tenantwise.com); 60 percent of Downtown Manhattan Class A space was lost in the attack. 114 A "large" tenant is one with at least 10,000 square feet of office space. 115 Tenantwise.com, July 2002: (http://www.tenantwise.com). In an evaluation of economic events in New York City a year after Septem-ber 11th, the New York City Partnership noted that most of the large employers that occupied space in and around the World Trade Center have decided to remain in Downtown or Midtown Manhattan.119 However, air travel into New York City's two major airports does not appear to be bouncing back.120 JFK and LaGuardia had already been experiencing a decade-long drop in their ranking in terms of passenger traffic even prior to the attack. JFK dropped from the seventh busiest airport to the fifteenth busiest from 1991 to 2001, while LaGuardia fell from the fifteenth busiest to the twenty-second busiest. Meanwhile, Newark fell from ninth in 1991 to thirteenth busiest in 2001. Traffic in New York City airports did increase by 7 percent between 1991 and 2001, but the rest of the nation's airports grew faster. However, since September 11th, air traffic has actually declined along with airline employment. Between August 2001 and August 2002, air transportation sector employment in New York City dropped 16.5 percent. After the attack these two airports lost traffic more rapidly than other major airports across the nation. The Partnership estimates that for about 70 percent of the insurance payments, the settlement process is complex; the payments from the insurance companies from these types of coverage will be slow. The November 2002 issue of the Economy Policy Review of the Federal Reserve Bank of New York estimates the range of earning losses, property destruction, and clean-up cost up to June 2002 at $33 billion to $36 billion or 6.4 to 7 percent of Gross City Product. 117 Office of the Comptroller, the City of New York, "The Impact of the September 11 WTC Attack on NYS's Economy and Revenues," October 4, 2001; also the NYC Comptroller's "One Year Later: The Fiscal Impact of 9/11 on New York City," September 4, 2002. The estimates of Gross City Product were taken from the September 2002 New York City report from Economy.Com. 118 Total cost estimates are varied depending on the methodology and the costs included. One estimate by the Federal Reserve Bank of New York puts costs (earnings losses, property damages, and clean-up/restoration of the site) at $33-36 billion through June 2002. See Jason Bram, James Orr, and Carol Rapaport, "Measuring the Effects of the September 11th Attack on New York City," Federal Reserve Bank of New York Economic Policy Review 8, November 2002, page 5. 119 The New York City Partnership, "Vital Signs: Economic Realities and Challenges Facing New York City One Year After 9/11," September 2002: (http://www.nycp.org). 120 Jonathan Bowles, "Bumpy Skies," Center for an Urban Future, October 25, 2002. The new proposals for rebuilding Lower Manhattan include the restoration of lost commercial real estate, new office space, recreational spaces, a new mass transit hub, and a new power distribution facility. The blue-prints for the development of Lower Manhattan gathered by the Lower Manhattan Development Corporation and the Port Authority include proposals to eventually replace all of the office space, and to build a transit center which will link the PATH system with the New York City subway system and the Long Island Railroad. The new transit system is intended to bring workers and others directly to Lower Manhattan. On February 27, 2003,121 a design proposal for the reconstruction of the World Trade Center site and Lower Manhattan was finally selected by the Lower Manhattan Development Corporation. This is the first step in what will be a multi-year, multi-faceted redevelopment effort. 122 "Manhattan Market Report: A Ten-Year Study," Insignia Douglas Elliman and Miller Samuel Inc., 2002. The economic effects of the attack of September 11th are concentrated in New York City. The effects of the recession and the effect of the attacks on the recession were felt throughout the State. This can be seen in the different composition of employment loss in downstate and upstate New York. The employment loss in downstate New York reflects the losses of New York City. The regional implications of September 11th are also seen in the employment data for Q4 2001. Compared with the same quarter in the previous year, New York State employment was 221,300 or 2.6 percent lower. New York City accounted for 154,700 or 69.9 percent of the loss of jobs that was experienced in the State. This share is large and establishes the regional nature of the disturbance to New York State. Figure 69 illustrates the higher relative magnitude of the employment loss in New York City. At the time of the attack, many economists expected that the impact of the disturbance to FIRE and services in New York City would be direct, and that the impact on the rest of the State would be felt through the effect of the attack on the national recession. This is due to the concentration of the FIRE sector in this area, and the strong relation between FIRE and service sector activity. Figure 70 compares the calculations of employment change in New York State and New York City based on the Covered Employment and Wages Program (ES 202) and the Current Employment Statistics (CES) Survey-both administered by the State Labor Department. The CES and ES 202 data both offer detailed employment figures for the State. The survey data is timelier, but is based on a smaller sample size. During times when the economy is close to turning points, the difficulties in estimating employment become apparent in the differences between the CES and the ES 202. 123 Robert Hall, Martin Feldstein, et. al., "The NBER's Business-Cycle Dating Procedure," Business Cycle Dating Committee, National Bureau of Economic Research, June 7, 2002. The ten largest industry-level employment losses that the State experienced in Q4 2001 over the previous year are shown in Table 10. These industries account for 174,650 jobs lost (or 78.9 percent of all jobs lost). Business services, the securities industry, wholesale and retail trade, and other service industries bore the largest employment losses in Q4 2001. 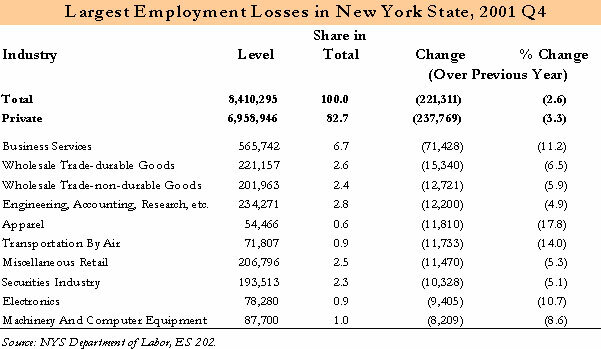 While business services and wholesale trade lost employment in upstate New York, the largest upstate employment losses were in manufacturing industries. Machinery and equipment, electronics, instruments, rubber, and fabricated metal manufacturers suffered the largest manufacturing employment losses, and were among the top ten industries for employment loss for Q4 2001 (see Table 10). Business services lost the largest number of jobs at 71,000 and accounted for 32.3 percent of the employment loss. Over 28,000 jobs were lost in wholesale trade. The loss of jobs in apparel reflected the loss of jobs in New York City's Chinatown, and the loss of jobs in air travel industry concentrated in Queens reflects the fall in demand for air travel during the early months of the recession and after September 11th. The securities industry lost 5.1 percent of its Q4 2000 employment level. High technology industries like machinery and equipment, electronics, and high-skilled professional service industries also lost large numbers of jobs. In the year preceding Q4 2001, the FIRE sector lost 16,900 jobs, or 71.1 percent of the 23,700 FIRE jobs that were created in the expansion of 1995-2000. The FIRE employment loss was concentrated in New York City. In fact, the FIRE employment loss in New York City was 103.8 percent of the State's FIRE employment loss, indicating that the rest of the State experienced a slight gain in FIRE employment. This regional concentration of employment loss is also true for the service sector, which lost 61,800 jobs. New York City lost 55,800 service sector jobs, which represent 90.2 percent of the State's service sector job loss (see Figure 71). The State's employment loss in FIRE and services was concentrated in New York City and in the securities industry and business services. However, the loss of manufacturing employment was dispersed across industries and regions. The manufacturing sector lost 66,600 jobs in the State between the fourth quarters of 2000 and 2001. This one-year loss in Q4 2001 is larger than the five-year loss of 64,700 manufacturing jobs in the State between 1995 and 2000. New York City lost 23,200 manufacturing jobs in Q4 2001-this loss reflects the effect of the attack on the apparel industry located in Chinatown. The manufacturing employment loss in the State outside New York City was 43,400 or 65.2 percent of the State's manufacturing employment loss. The airline industry experienced total losses of $7.7 billion in 2001, the first annual loss since 1994.124 Both the national recession and the September 11th attacks affected the industry. New York airports appear to have been disproportionately affected by the recent slow-down in passenger and cargo traffic. In New York State, the air transport industry employment loss was concentrated in Q4 2001. A total of 11,700 jobs (7,600 of which were in Queens County) were lost compared to the previous year's fourth quarter. In response to the loss of operating revenue, airline companies have responded through a variety of cost-cutting measures, which include staff reduction, wage reduction, lower discounts, reduced in-flight services, rescheduling/reduction of flights, internet sales of tickets, and the reduction of fleet size. In all sectors that lost jobs, the intensity of job loss in percentage terms was higher in New York City (see Figure 72). The manufacturing sector was hardest hit: the State lost 7.6 percent of its employment in Q4 2001, while New York City lost 9.7 percent. Utilities and trade lost jobs at 4.7 percent and 3.3 percent, respectively. 124 Operating loss in 2001 was the first annual loss after 1992 and includes $5 billion from the federal government given to the airlines after September 11th. "ATA Annual Report 2002," and "U.S. Airlines: Historical Trends," Air Transport Association of America: (http://www.airlines.org/public/ home/default1.asp); Amy Tsao, "Can Airlines Bring Costs Down to Earth," BusinessWeek, Oct. 23, 2002; and Jonathan Bowles, "Bumpy Skies," Center for an Urban Future, New York City, 2002. Between 1995 and 2000, the State gained $113.8 billion in wages-this was at the average rate of $22.8 billion every year. However, wages in 2001 decreased due to the softening economy and the events of September 11th. The wage loss was also felt more severely in New York City than in the State. Compared to the previous year, New York State wages decreased $10.8 billion or 2.6 percent in Q4 2001. New York City wages declined $12 billion or 5.3 percent during this period. The loss of wages was concentrated in the securities and business services industries. In fact, excluding these two industries, wages in the State increased. Together, the securities industry and business services accounted for 117.1 percent of all the wages lost in the State in this period. The securities industry lost $7.8 billion or 72.3 percent of the State's wage loss in the year preceding Q4 2001. Holding and Investment offices lost $0.8 billion in wages. Wholesale trade and industries such as hotels and eating and drinking places lost $2.0 billion in wages combined. Professional services, printing and publishing industries, and motion pictures also were among the ten industries in which the wage losses in the State were the largest (see Table 11). Services and FIRE accounted for $73.8 billion of the wage increase between 1995 and 2000 or 64.9 percent of the total increase in wages in the State. The securities industry accounted for 24.1 percent of the wage increase between 1995 and 2000, and the business services industry accounted for 12.3 percent. 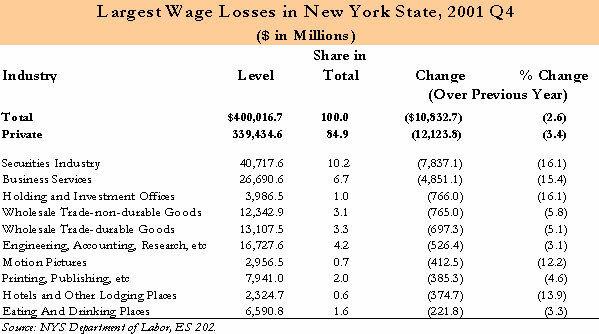 In all sectors that lost wages, the loss was more severe in New York City (see Figure 74). The intensity of State wage loss was sharpest in FIRE, which lost 8.4 percent in wages between the fourth quarters of 2000 and 2001. In the same period, New York City (which pays 84.5 percent of the State's FIRE wages) lost 10.2 percent in FIRE wages. In services, New York City lost 5.0 percent in wages and in trade the loss was 3.1 percent. Though the manufacturing sector lost a large number of jobs between 1995 and 2000, wages grew 21 percent in the State. In Q4 2001 however, manufacturing wages fell 2.6 percent over the previous year. New York City manufacturing wages declined 5.8 percent during this period. 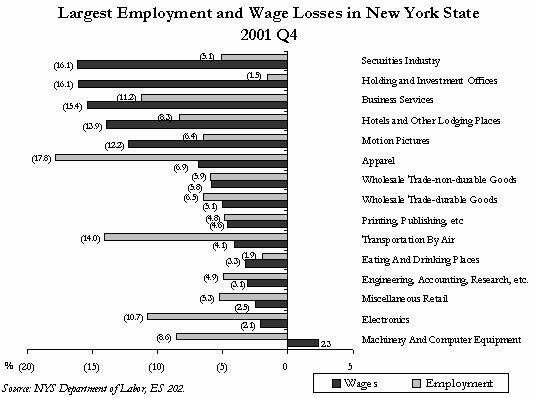 The intensity of employment and wage loss was also uneven in many industries (see Figure 75). In business services, wholesale trade, printing and publishing and professional services, employment and wages were lost at roughly the same rate. In the securities industry, holding and investment offices, and motion pictures, the intensity of wage loss was higher. In the securities industry 16.1 percent of the wages were lost in Q4 2001 over the previous year, but the employment loss was 5.1 percent. This implies the loss of relatively higher-paying jobs in this industry or reductions in average salary plus bonuses in higher incomes groups. In apparel, air transport, electronics, and machinery and equipment, however, the employment loss was higher than wage loss in percentage terms, indicating the loss of relatively low-paying jobs. The regional and industrial concentration of the State's wage loss was much more severe (see Figure 76). The FIRE and service sectors together accounted for 90.1 percent of the State's total wage loss. Within FIRE, the wage loss was borne largely by the securities industry, and within services, by the business services industry (see Table 11, page 103, and Figure 76). While the loss of FIRE and service sector wages was borne by New York City, wages in the rest of the State grew in these sectors during this period. Among the sectors, manufacturing lost the largest number of jobs, but the wage loss of $1.2 billion was small in comparison with the loss of wages in FIRE and services. Between 1995 and 2001, wages in New York State grew at 6.5 percent per year. Among the regions of the State, New York City grew the fastest and wages grew at the rate of 7.6 percent per year. Wages in downstate New York grew faster than upstate, with wages in the Mid-Hudson region growing at 6.2 percent per year and Long Island wages growing at 5.5 percent per year. Wage growth in the State's regions ranged from 7.6 percent to 3.2 percent in this period (see Figure 77). 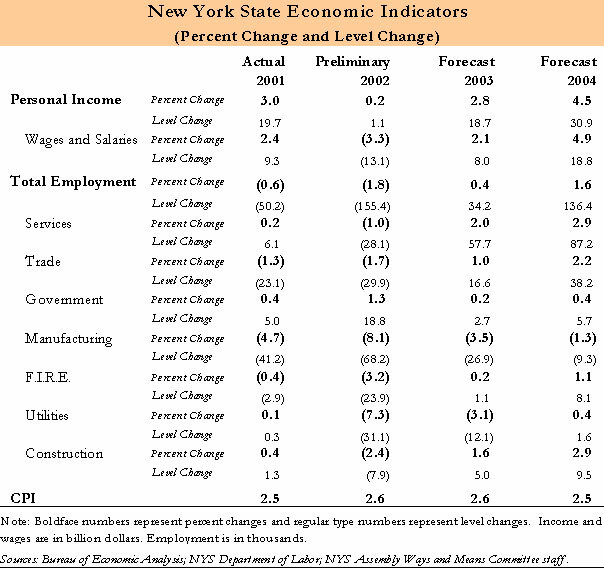 New York State employment growth averaged 1.4 percent per year in the 1995-2001 period. Most regions that had high wage growth also had high employment growth. The fastest employment growth was in the Mid-Hudson, followed by Long Island and New York City. In New York City, Richmond county employment grew the fastest, at 2.3 percent per year. In upstate New York, Southern Tier, the Capital Region, and North Country had the largest growth in percentage terms (see Figure 78). While New York State employment grew a total of 8.8 percent between 1995 and 2001, the nation grew 12.6 percent. If New York State grew at the same rate as the nation over this period, 289,900 additional jobs would have been created. Of the 603,000 jobs created in the State between 1995 and 2001, downstate New York gained 510,000 or 84.6 percent. Upstate New York gained 93,000 or 15.4 percent.125 In 2001, downstate New York accounted for 66.5 percent of the State's employment, and 76.0 percent of the wages. The New York City region employs the largest number of people among the regions. In recent years, the region also accounted for a large share (47.0 percent) of the additional jobs that were created in the State. Long Island and the Mid-Hudson region also shared in the large gains in employment that were made in recent years. These two regions accounted for 27.9 percent of the 560,800 additional jobs that were created between 1996 and 2001. The three largest gains in employment in upstate New York were in the Capital, Finger Lakes, and Southern Tier regions. While the employment gains in New York City in recent years has been impressive, the wage increase in this region is even more so. Between 1995 and 2001, wages in New York City increased by $76.8 billion. This accounts for 62.4 percent of the wage gain in the State as a whole. The wage gains in New York City were driven by the increase in the FIRE sector of $35.3 billion. The other downstate regions gained $23.4 billion in wages or 19.0 percent of the State's wage gains. Among the upstate regions, Capital, Western New York, and Finger Lakes regions had the largest wage increases. Together, these three regions accounted for $13.6 billion or 8.9 percent of the wage gains in the State. 125 This calculation does not include 78,000 in employment gains that is not regionally classified. The current classification of economic data into sectors and industries, based on the Standard Industrial Classification system (SIC) is being replaced by the North American Industrial Classification system (NAICS). Data in the 1997 Economic Census were available on a NAICS basis; the Covered Employment and Wages Program and the Current Employment Statistics Survey Program will release New York State data during 2003. The SIC system was established in 1938; the United States was predominantly a manufacturing economy. Both the structure of production and the technologies of production are vastly different from those in the 1930s-today's economy is more service-oriented, and information-based. The new classification system is designed to suit these economic changes. SIC (Standard Industrial Classification) System first introduced in 1938. New service sector industries and the increase in service sector share. Changes within the manufacturing sector-the need to reclassify high technology and information industries. The need for a unifying principle of classification-NAICS is based on production process characteristics and business characteristics. Greater ease in comparison in North America. New sectors: information, education, health, professional services, and management. New terminology: supersectors, sectors, NAICS industries, and U.S. industries. Correspondence tables available, perfect match not possible for New York before 1999. Historical data for New York will be available from 1990 onwards. National aggregates at the sectoral level will be available from 1938. Covered Employment and Wages Program (ES 202): Fall 2002. Current Employment Statistics: June 2003. Source: Bureau of Labor Statistics; Bureau of the Census. Two notable changes in the new system are the redefinition of manufacturing, and the creation of several new service sectors, including the new information sector. The new financial services sector includes only finance and insurance; real estate services are included in a new sector. Classification in the SIC system was based both on production characteristics and on the nature of the product; NAICS classification is based on production characteristics. A new National Product Classification system (NAPCS) is currently being developed. While there is strong similarity in the numbering system of the NAICS and SIC systems, NAICS enables more fine classification of industries-the NAICS numbering system has six digits, while the SIC system has four. The NAICS system involves new terminology-a NAICS sector has a two-digit NAICS number, and a NAICS industry has a five-digit number. The NAICS system will be reviewed every five years. There is a separate category that counts employment and wages in establishments that are headquarters of companies, and those that primarily house managerial personnel; this is significant to New York City. Though a NAICS history will be available from 1990 onwards, the creation of longer historical series is difficult in many cases. This impedes the ability to perform historical comparisons.